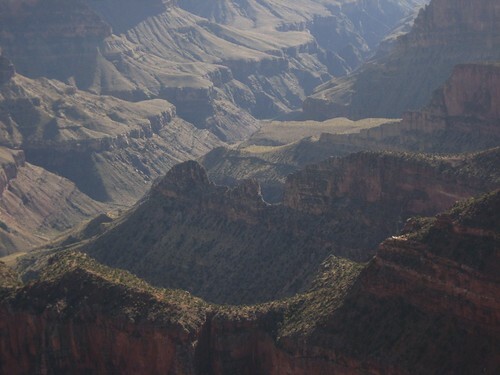 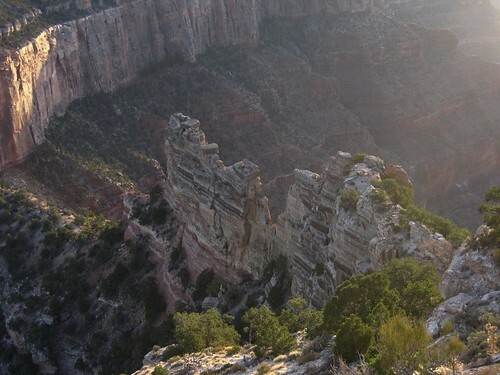 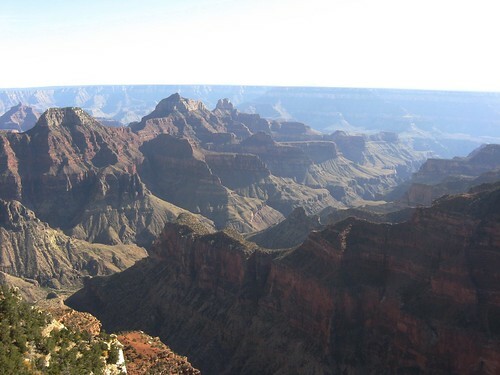 Sick of the Grand Canyon yet? 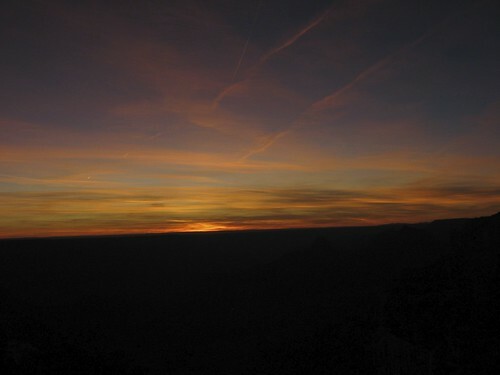 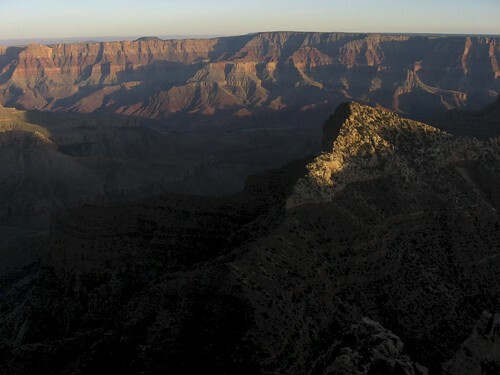 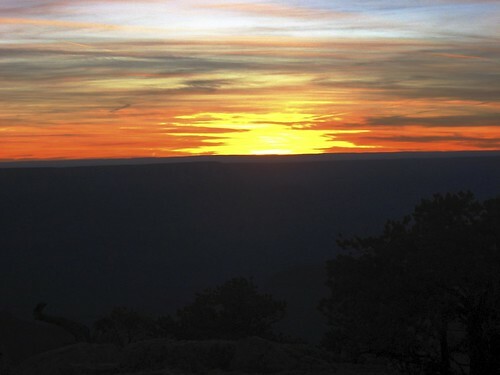 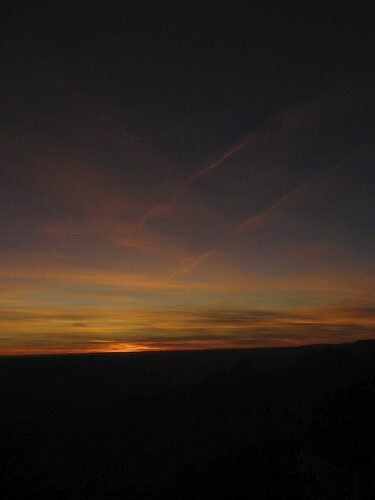 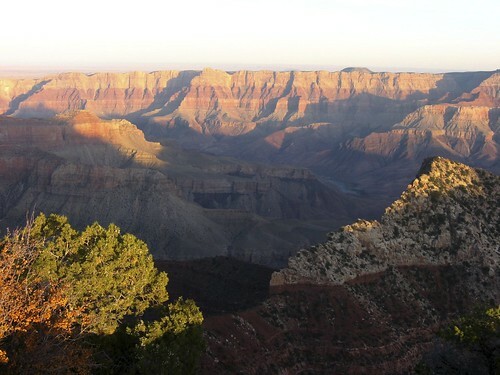 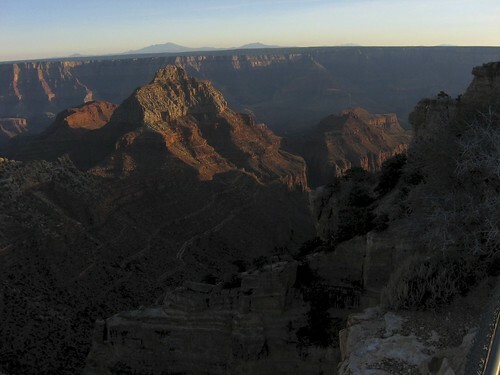 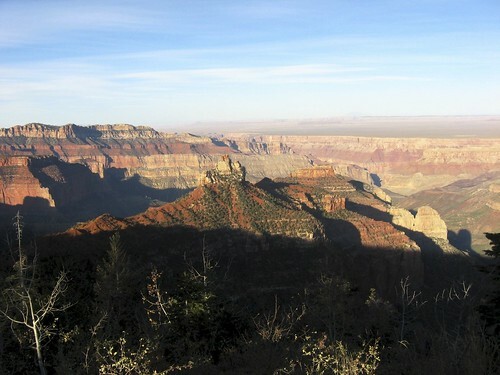 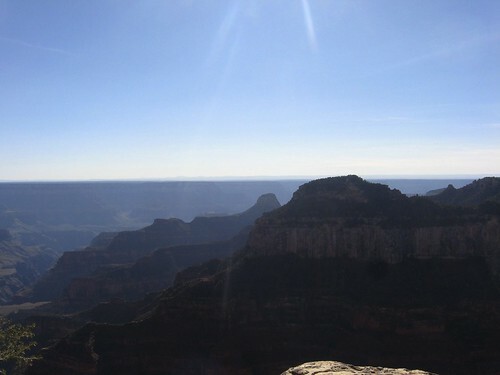 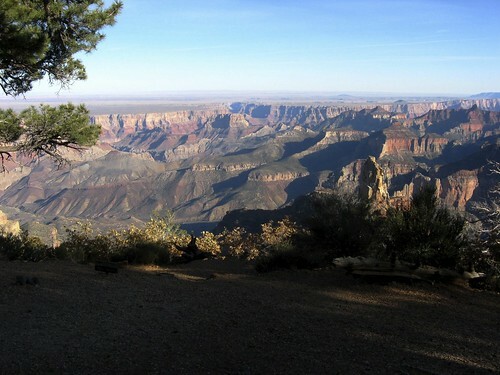 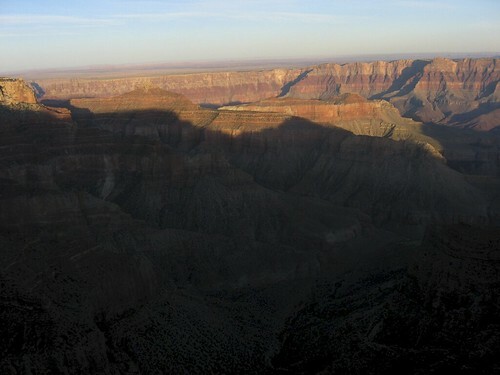 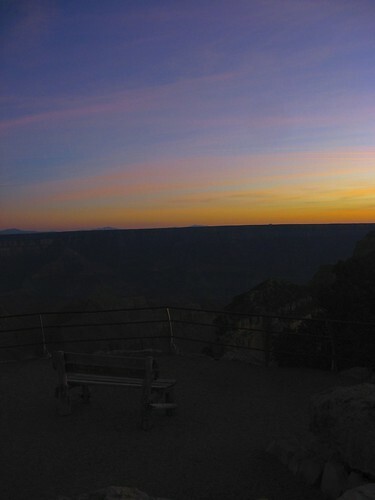 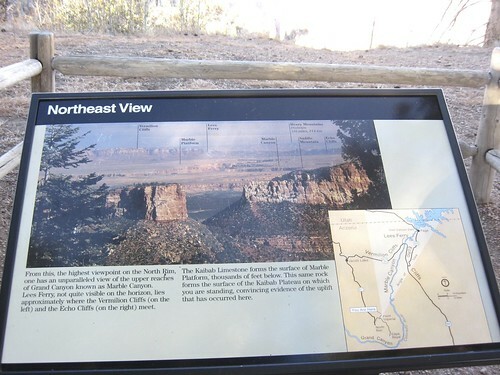 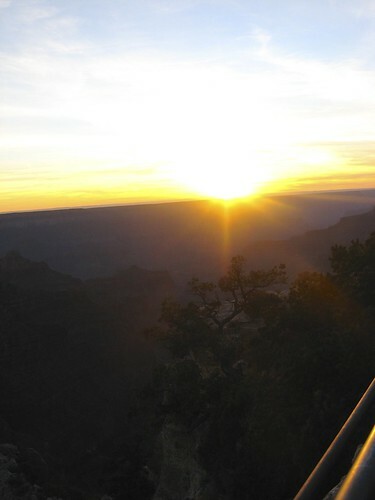 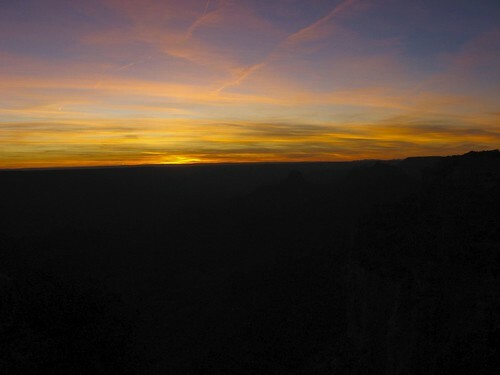 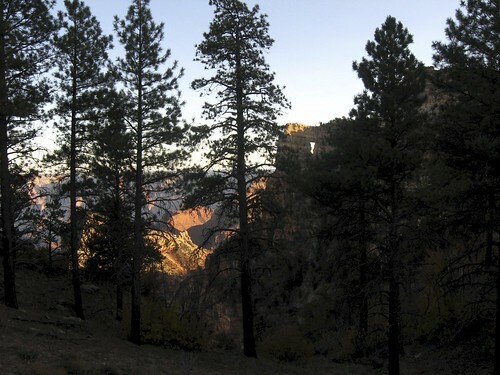 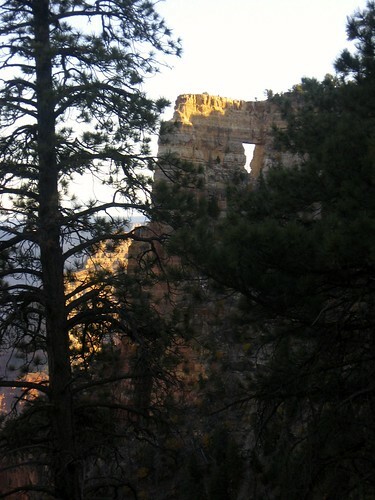 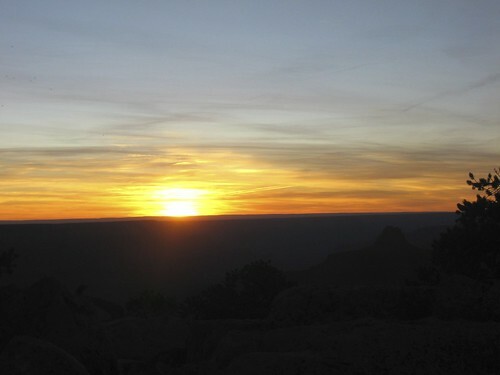 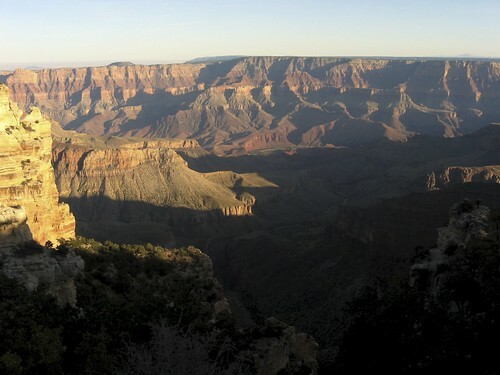 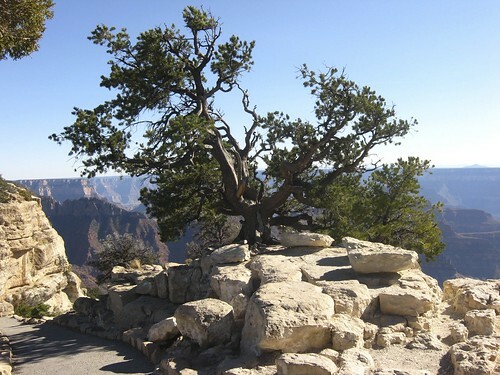 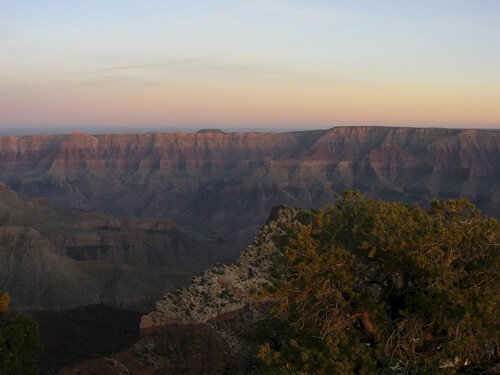 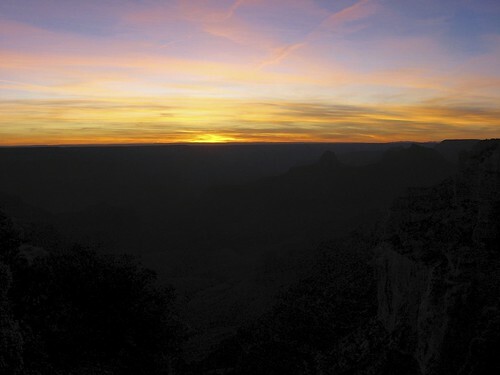 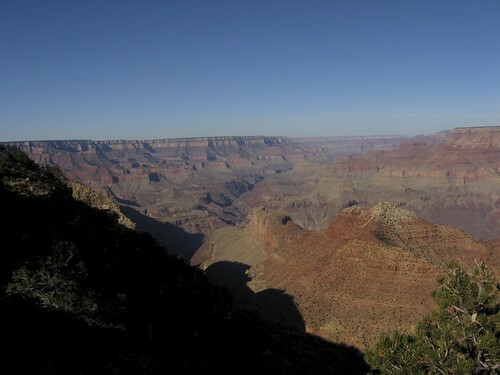 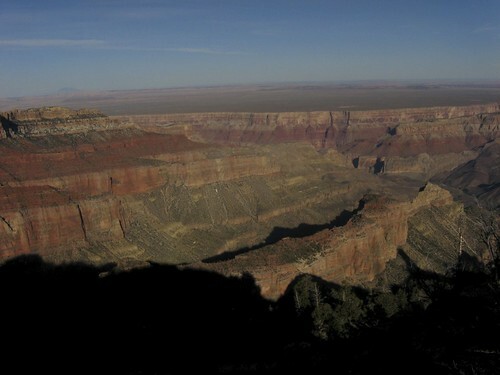 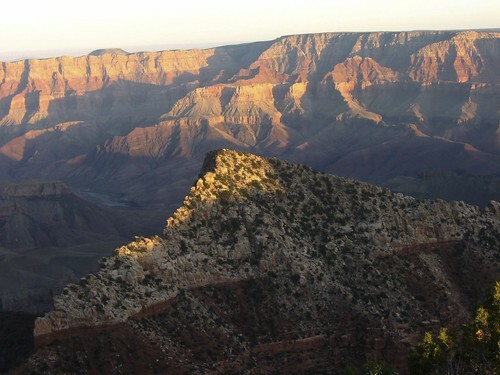 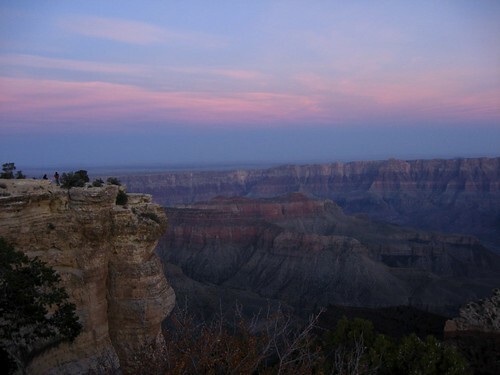 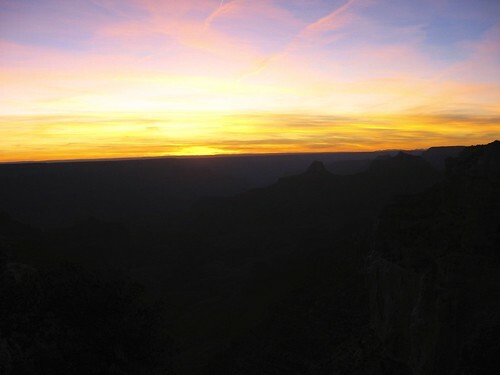 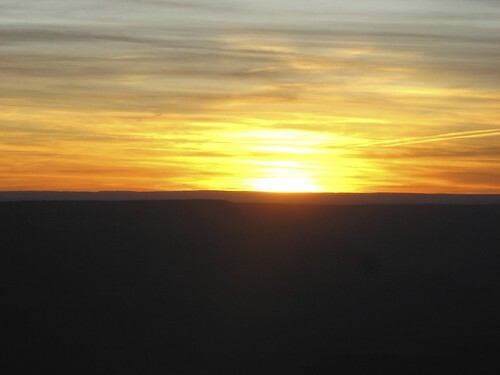 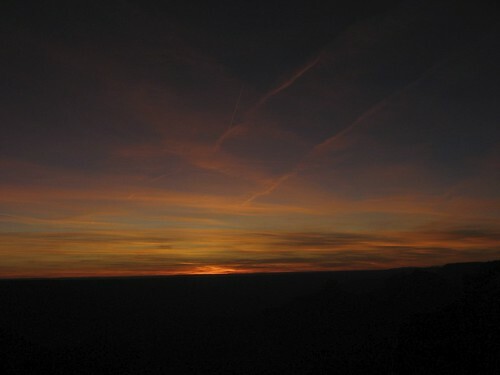 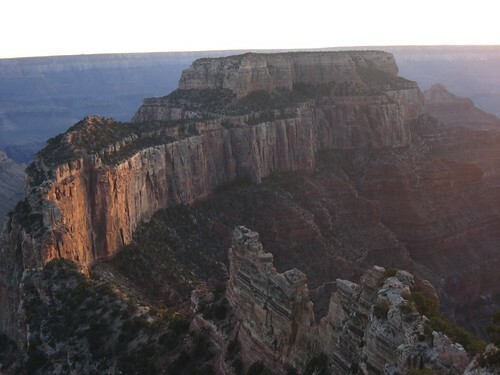 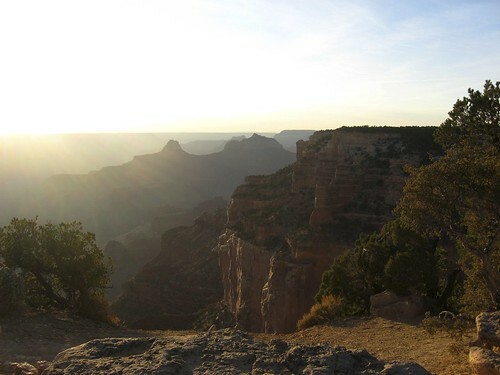 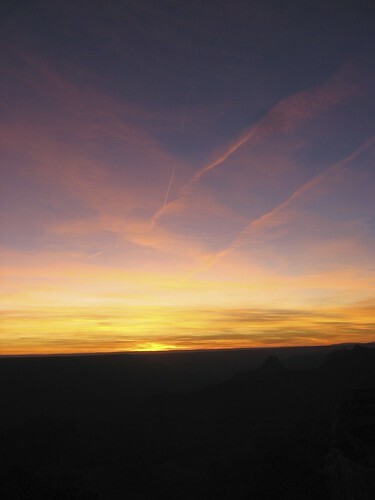 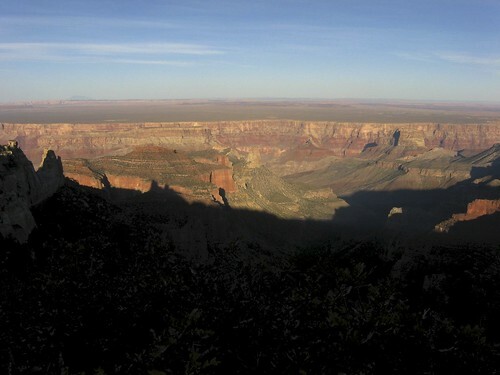 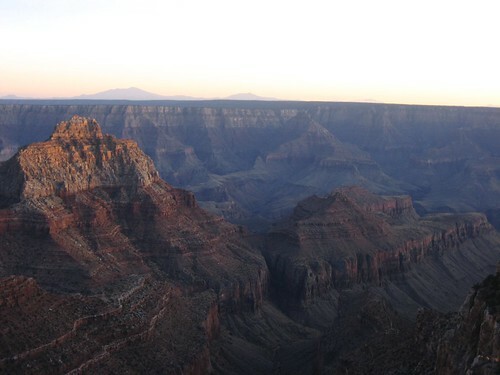 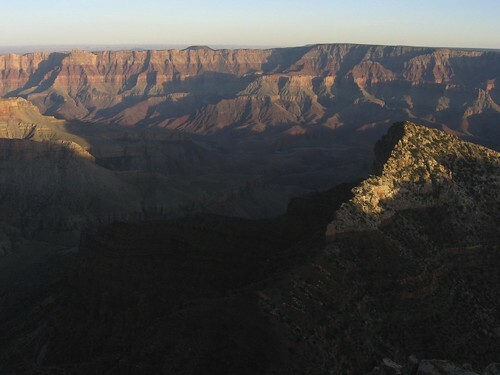 The next morning, early, we checked out Mather Point again, to see if the light was any different, before preceding on our long drive to the North Rim. 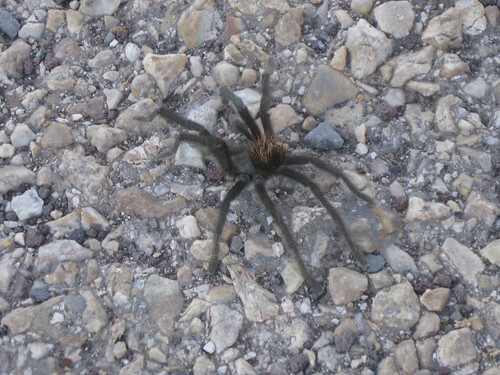 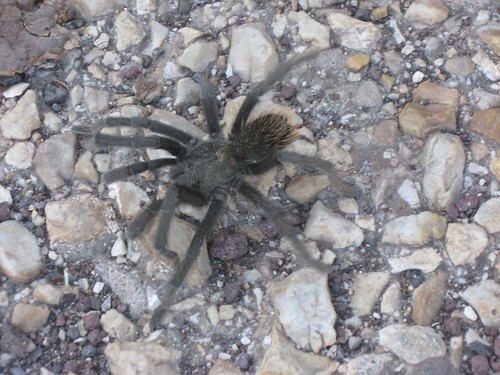 Ok, next is a tarantula we saw, so if you’re freaked out by spiders, skip the next few pics! 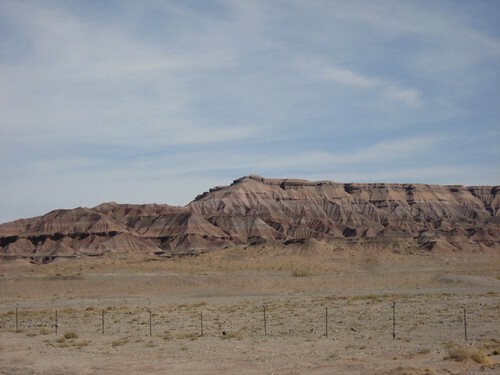 We drove out through the Painted Desert which is really odd and garishly colored and very Spaceman Spiff (from Calvin and Hobbes). 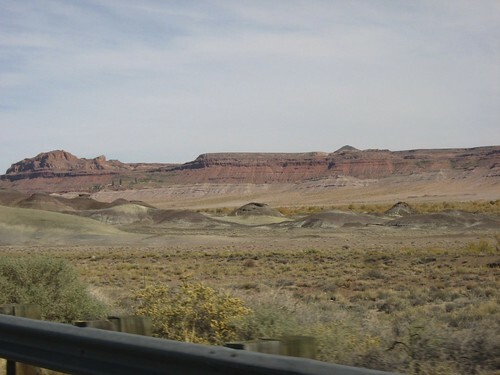 It’s ugly and kind of beautiful at the same time. 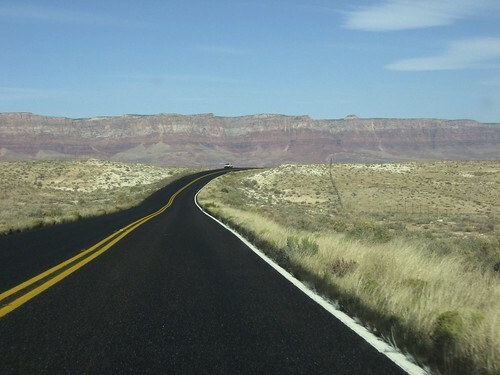 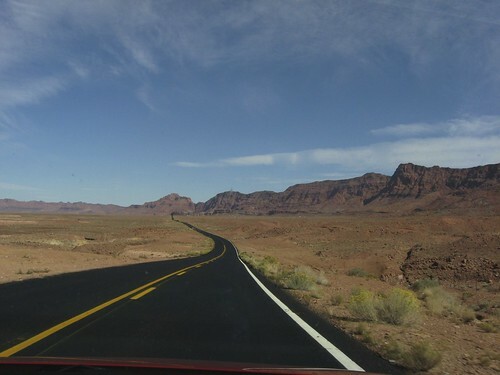 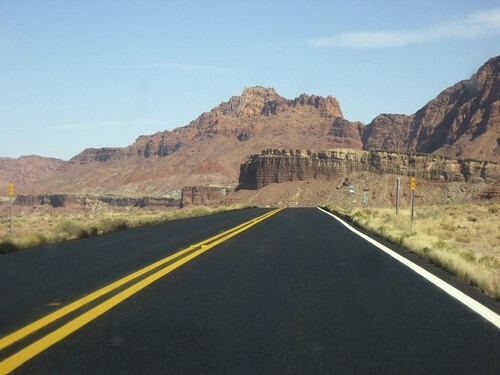 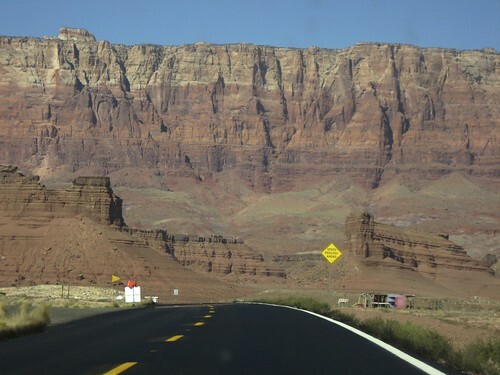 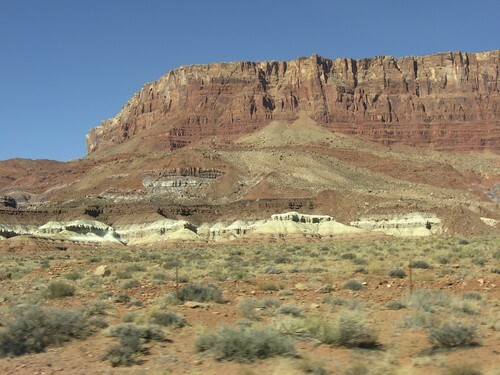 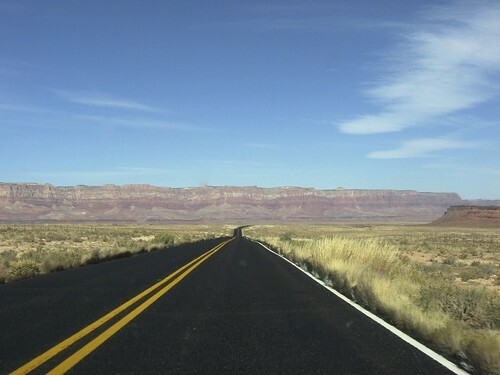 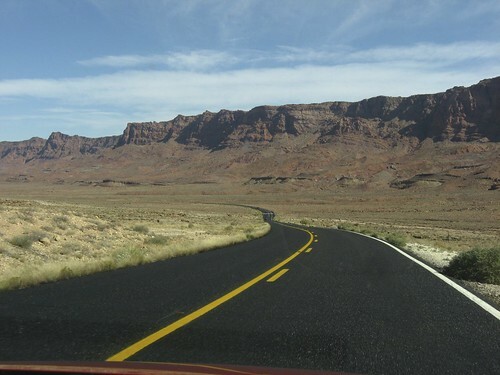 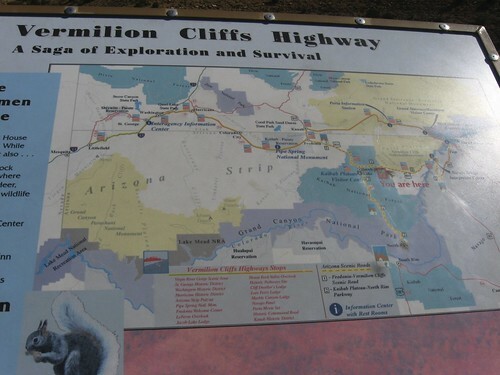 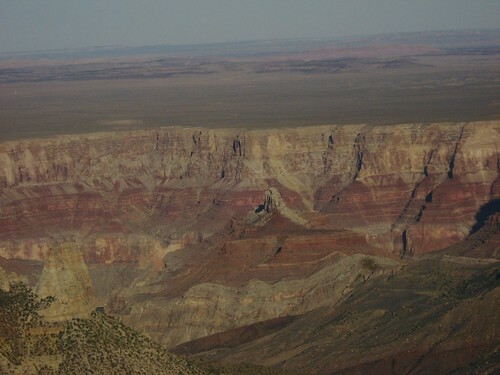 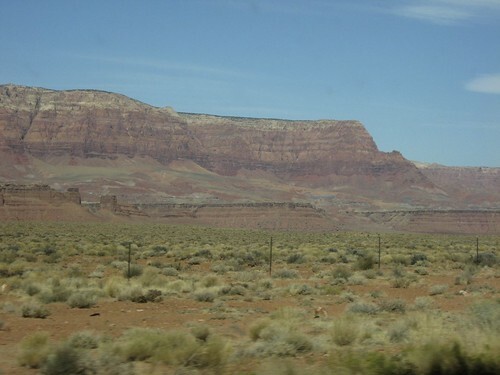 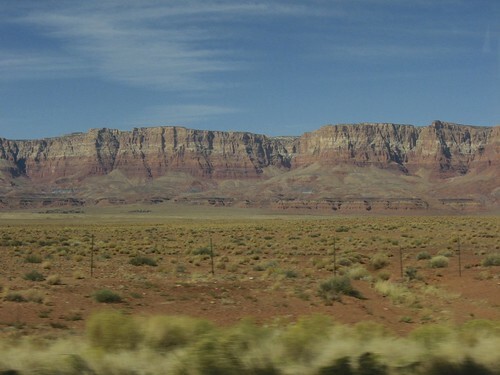 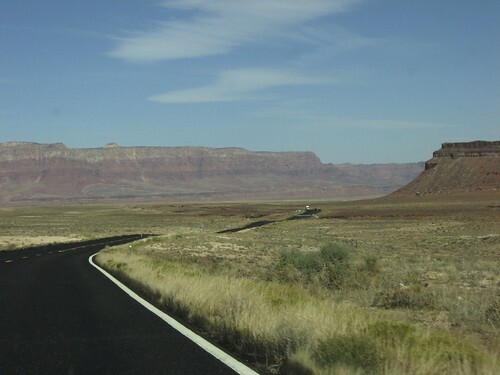 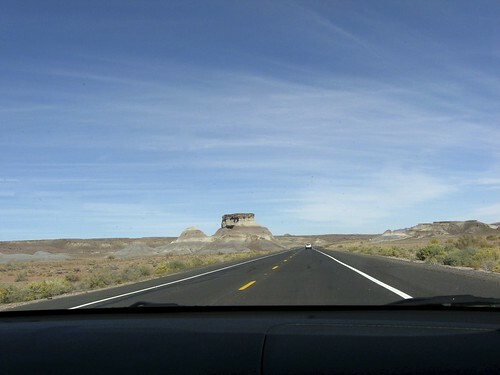 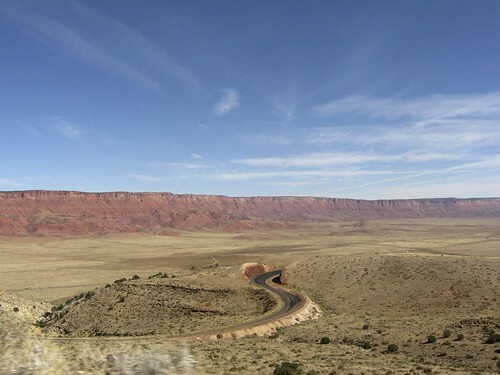 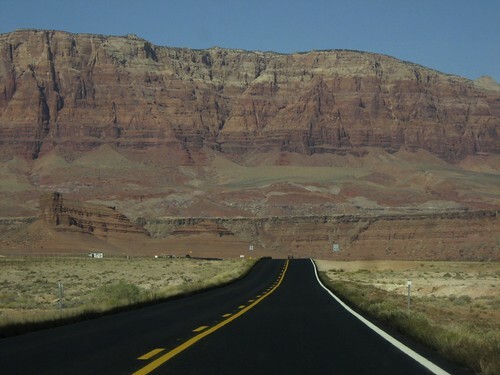 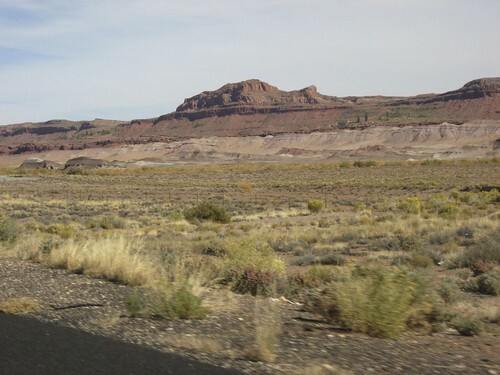 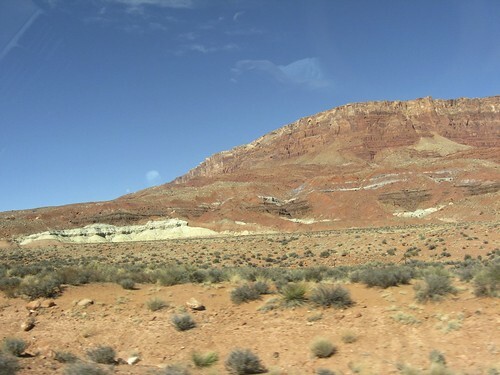 We also drove near Marble Canyon, which is actually geologic beginning of the Grand Canyon. 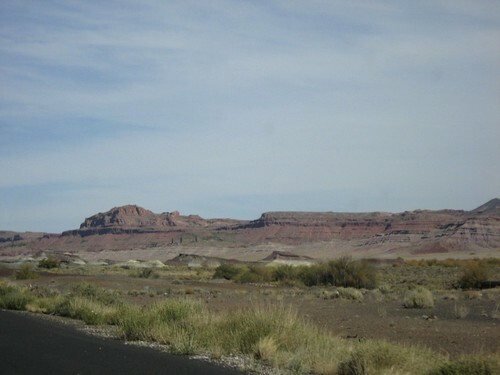 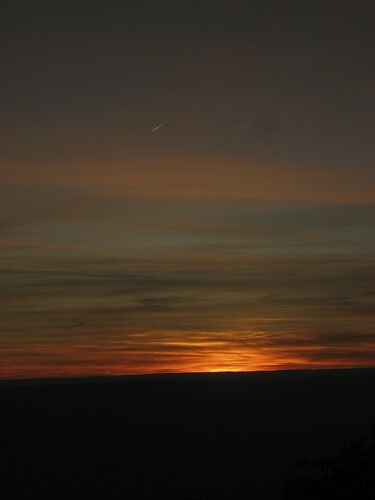 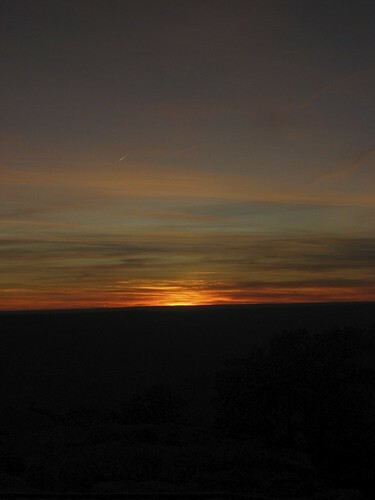 During the drive through the Painted Desert. 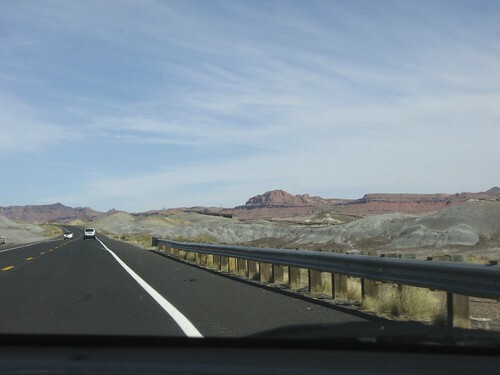 I wish I’d taken more pics, but the landscape was so bizarre, I was busy watching it and not photographing the ugly parts! 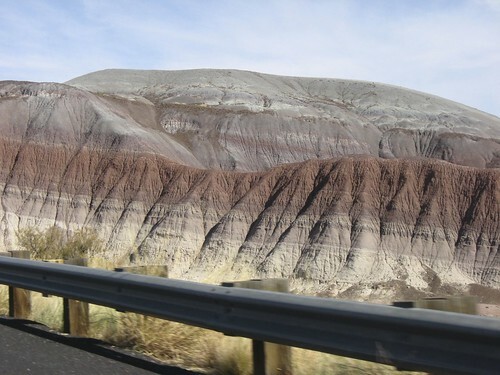 Here are some though -lots of mounds that were odd colors. 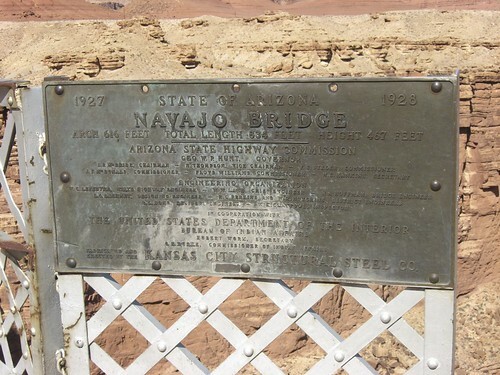 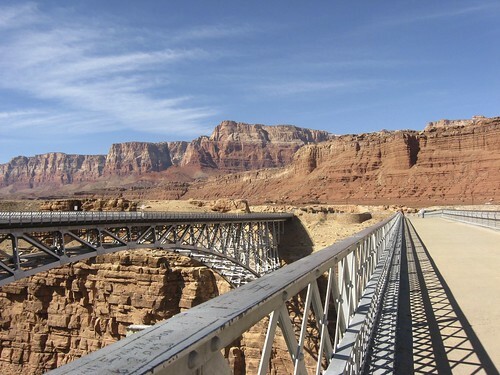 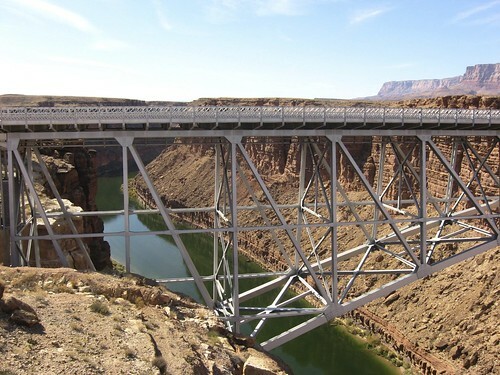 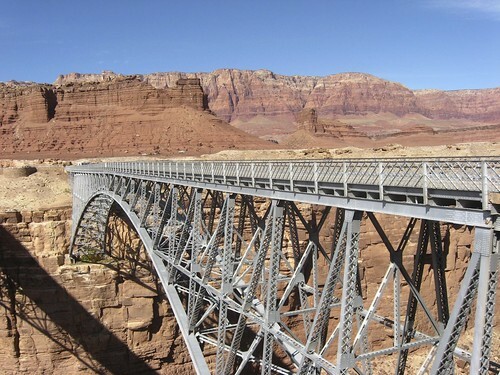 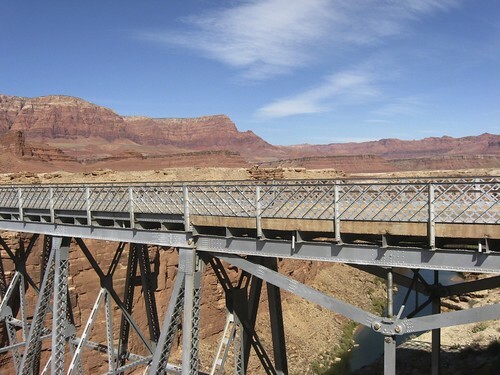 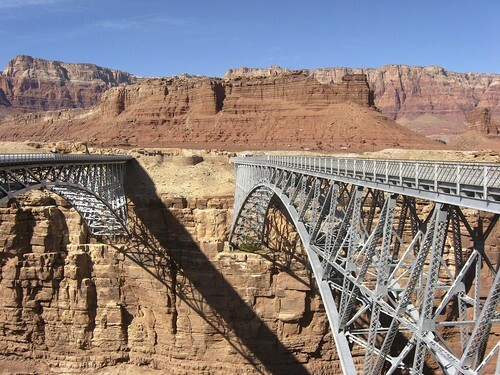 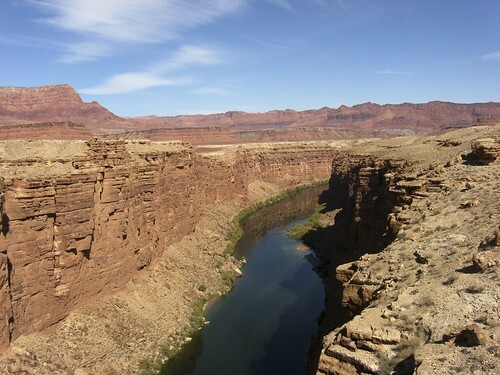 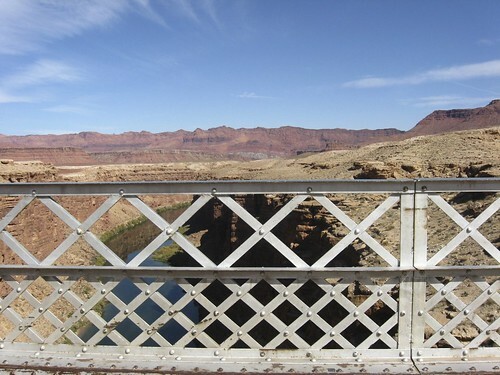 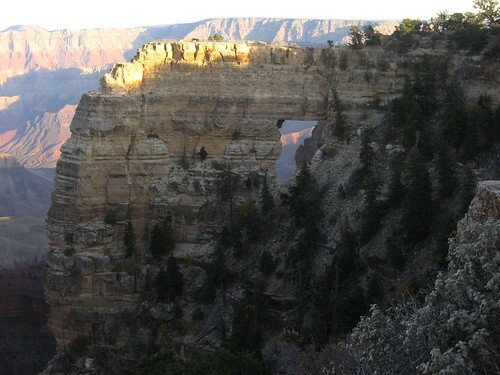 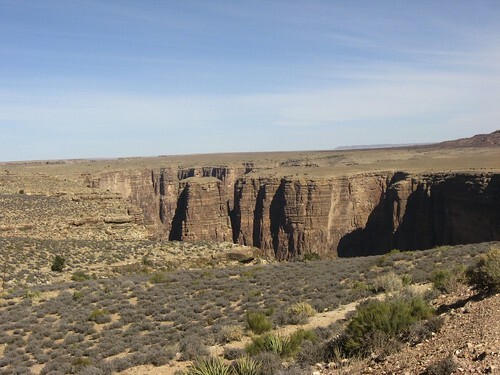 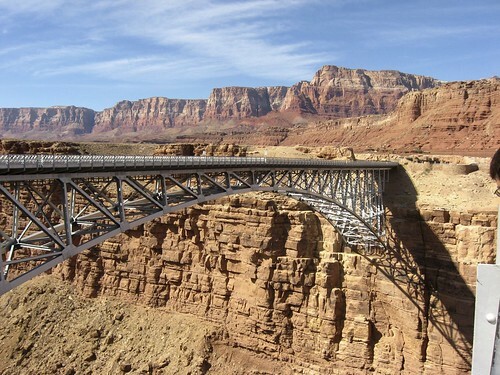 Here’s where we come to Navajo Bridge, which is where you cross the Marble Canyon. 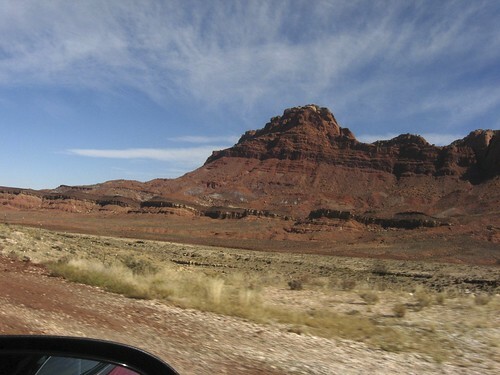 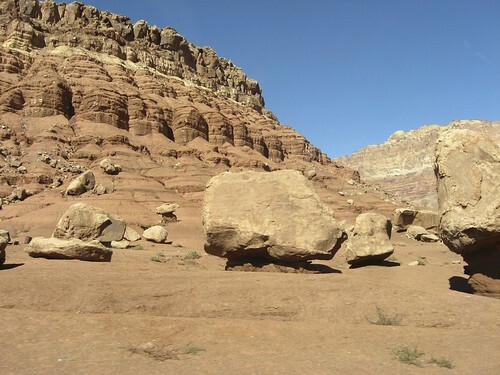 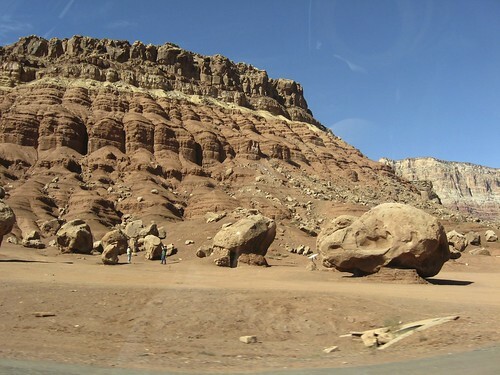 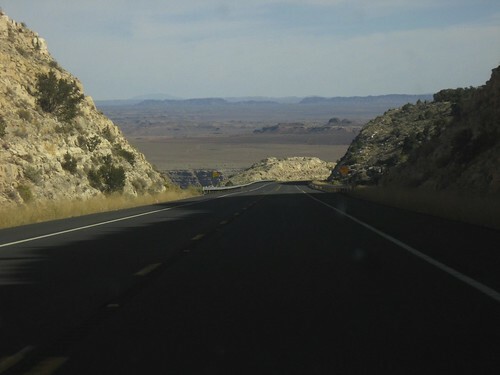 Continuing on our drive – these were some really big rocks. 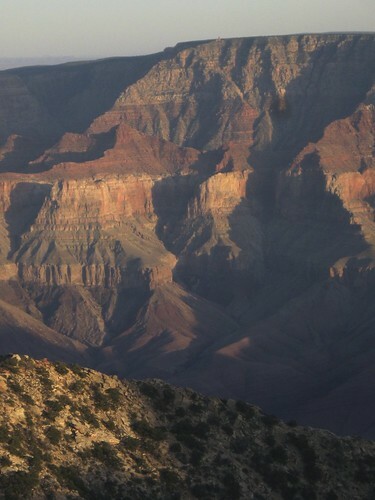 I like the people taking pictures in front of them! 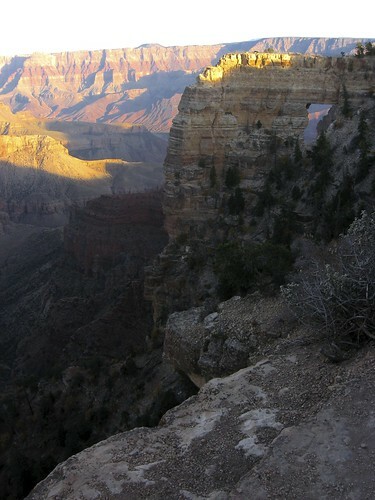 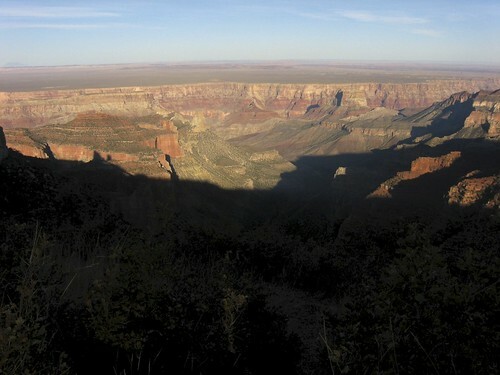 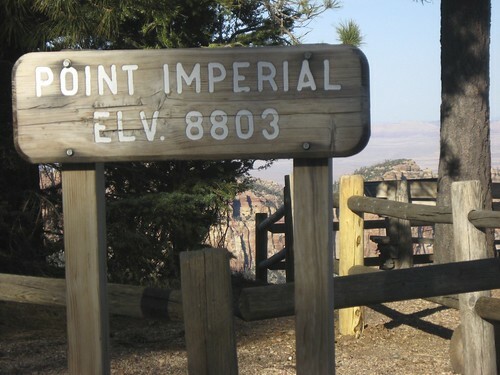 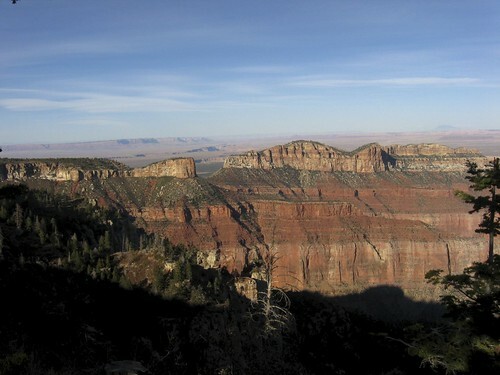 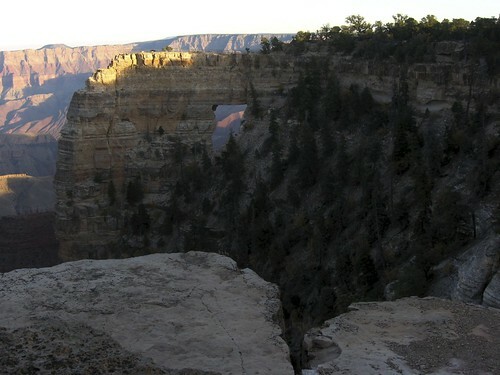 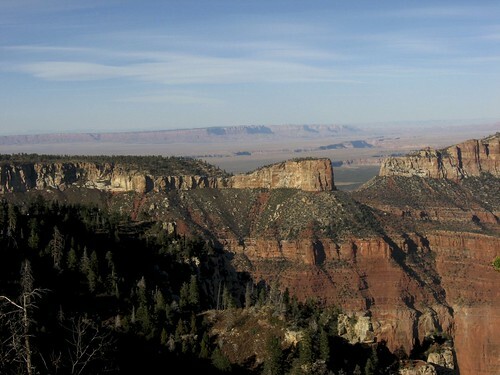 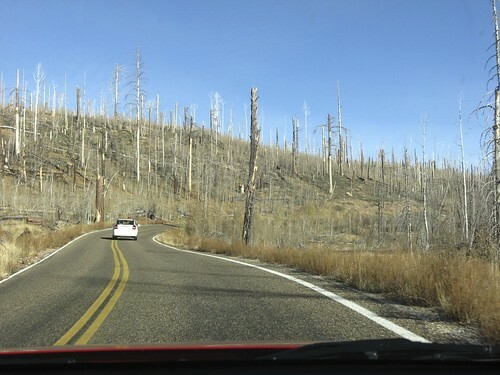 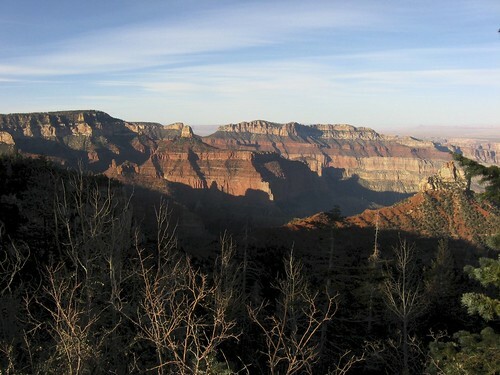 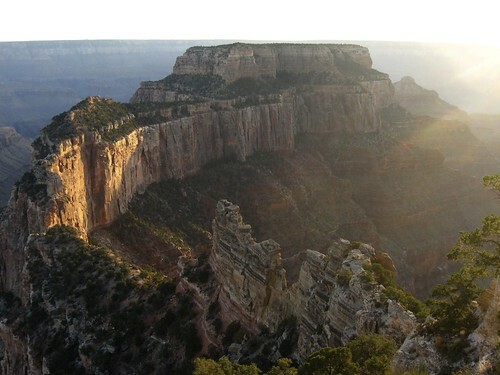 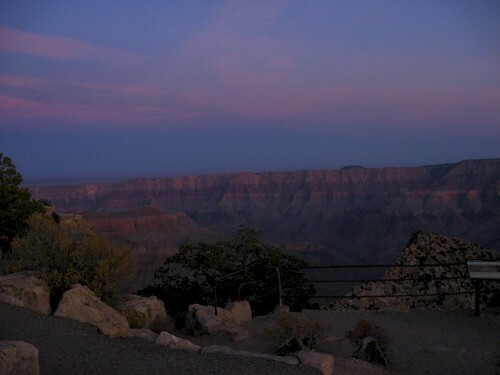 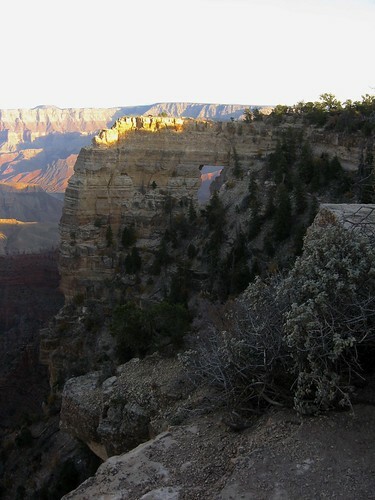 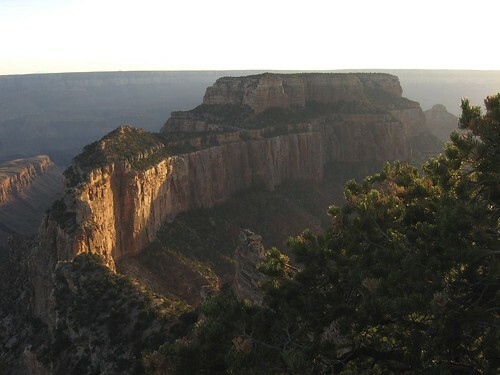 And here we are on the North Rim, 4 or 5 hours later, near the lodges. 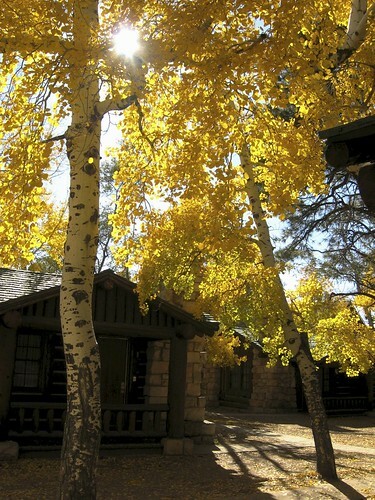 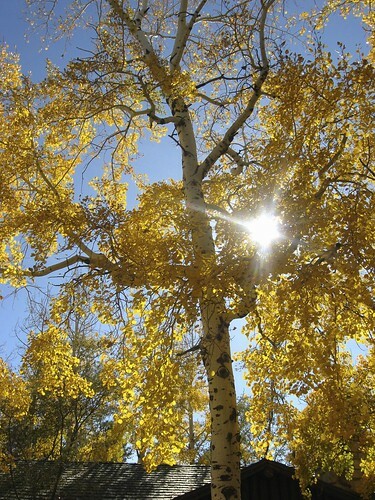 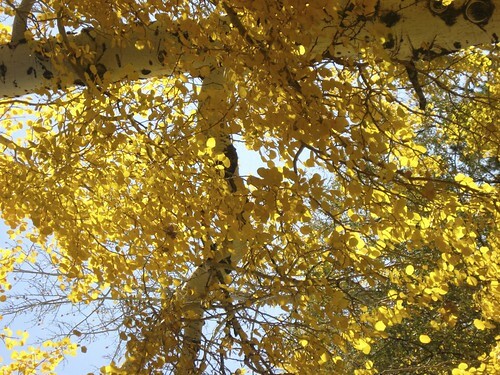 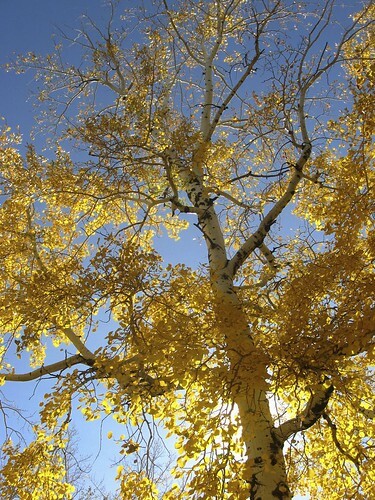 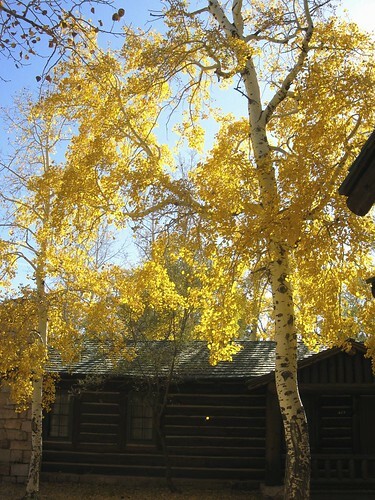 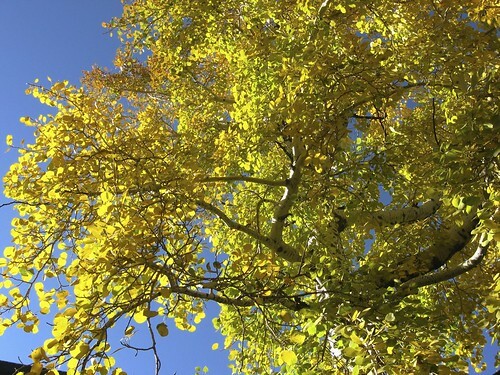 Quaking Aspens are now my favorite trees. 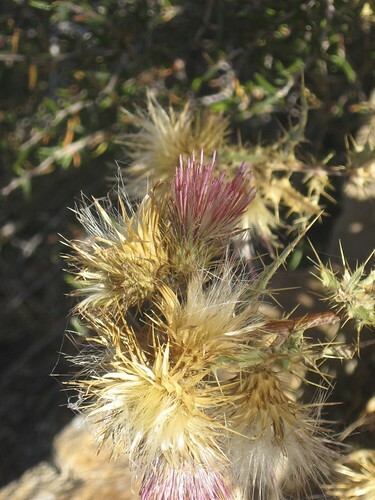 They are gorgeous in the sunlight! 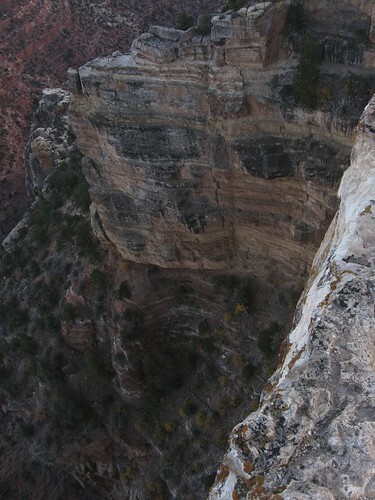 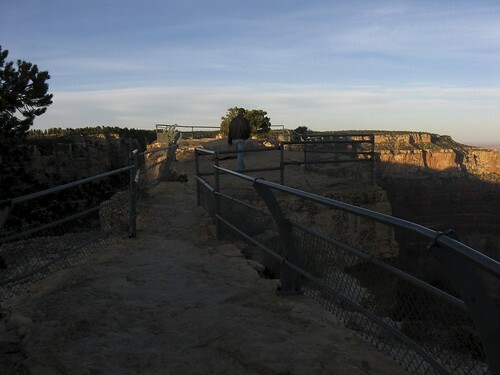 I believe that is Bright Angel Canyon down there – we’re sort of at the other end of it – you could see it from the South Rim. 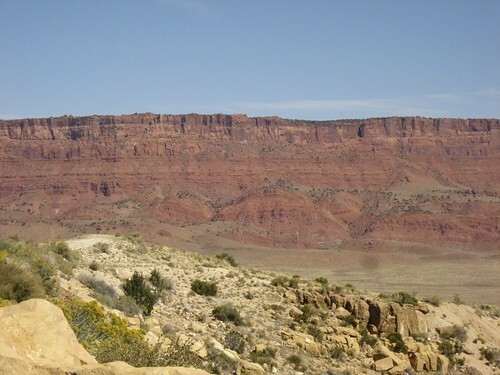 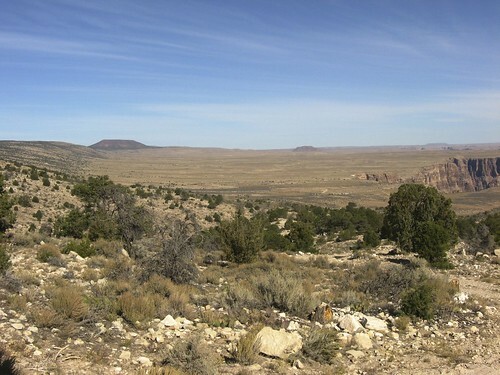 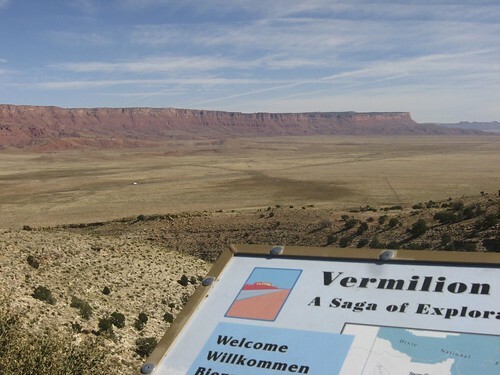 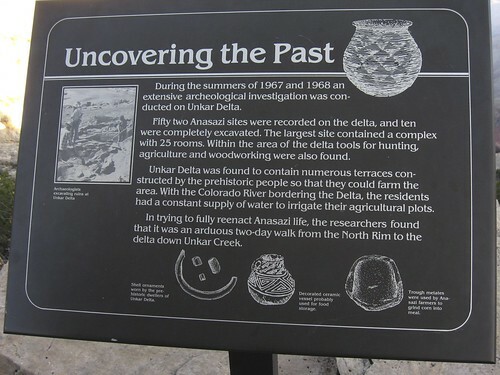 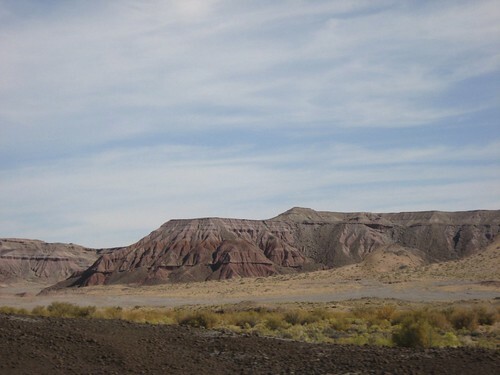 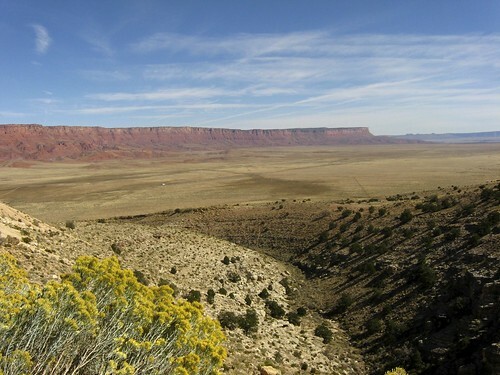 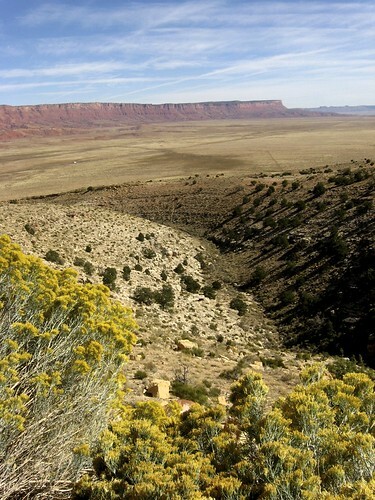 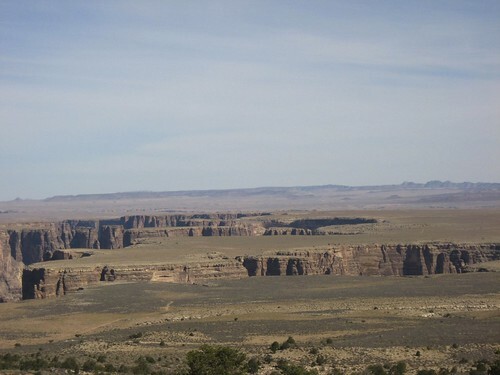 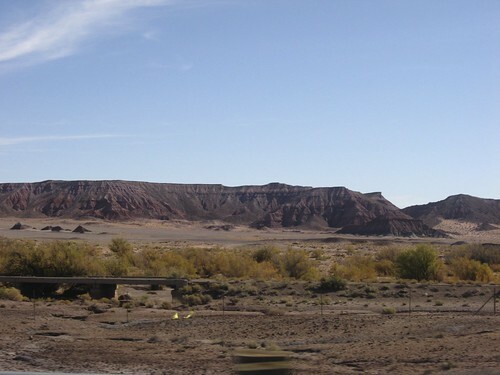 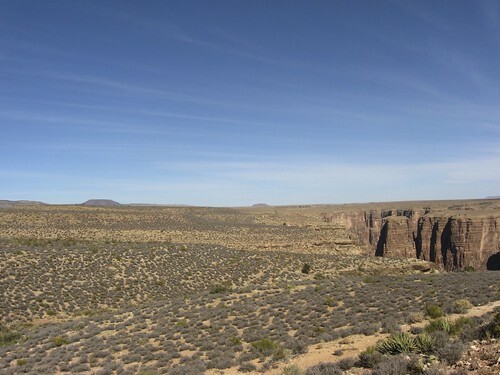 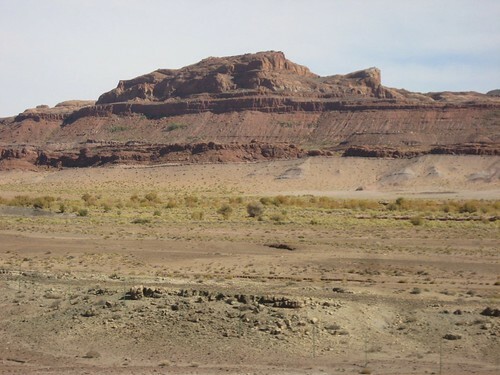 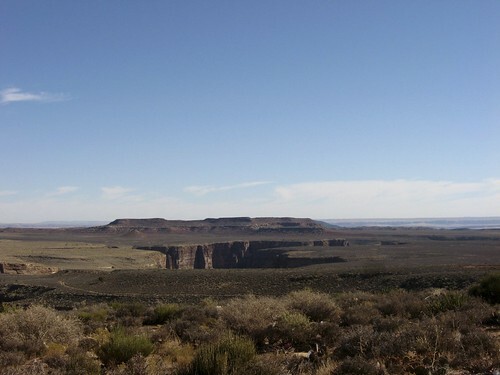 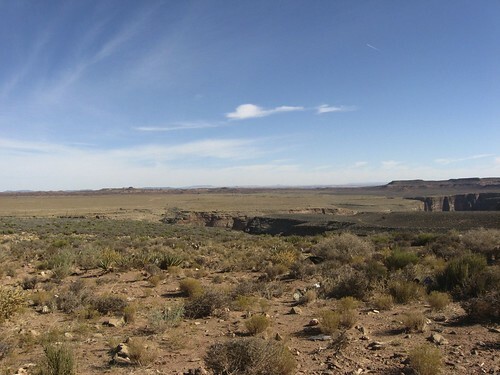 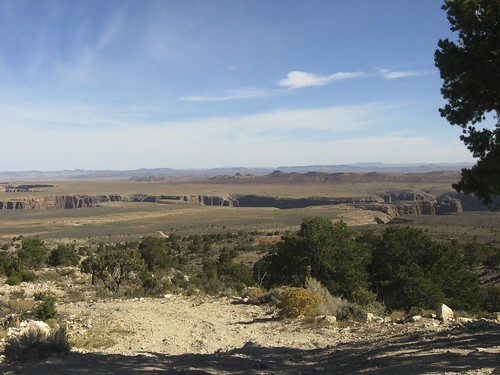 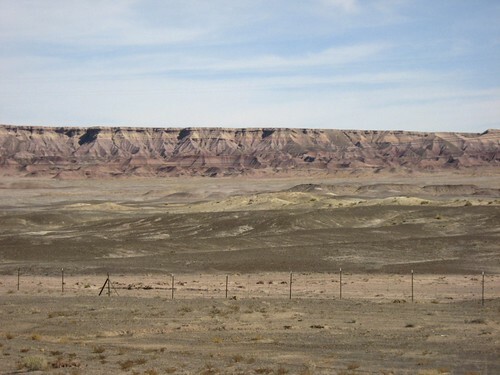 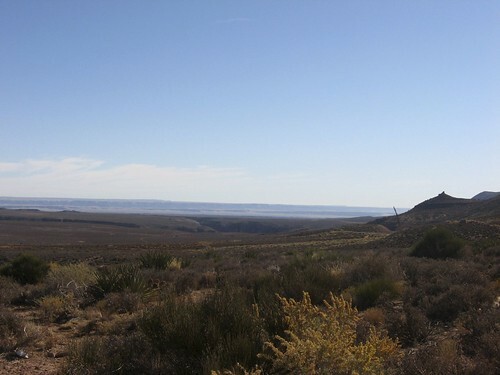 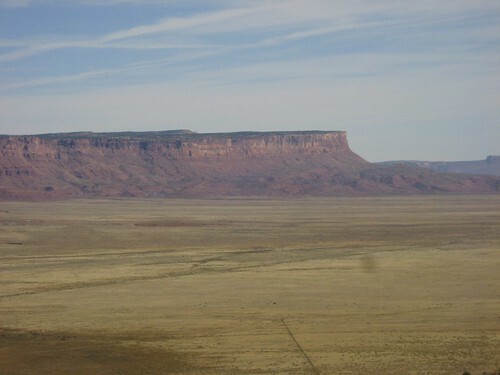 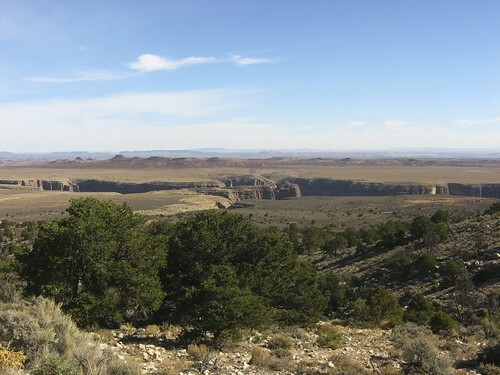 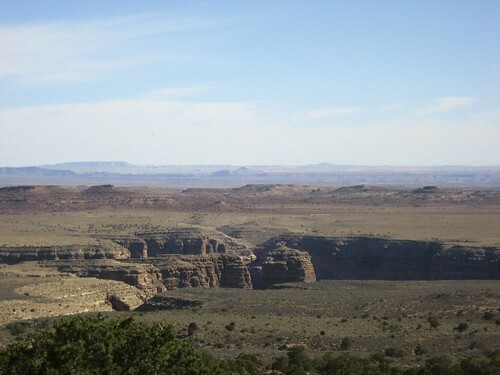 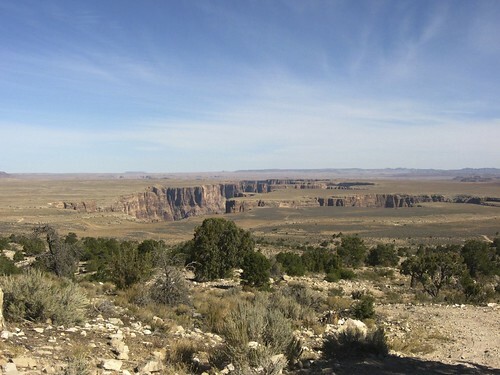 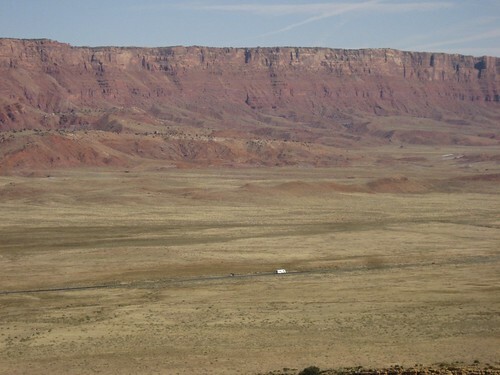 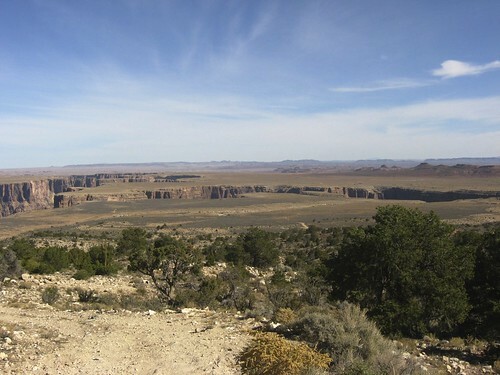 The Unkar Delta where some Anasazi lived during the winter – and up on the plateau where we were in the summer. 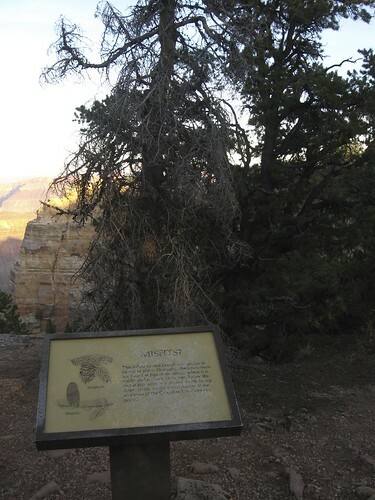 This sign talked about how well these trees were adapted for this altitude and temperature. 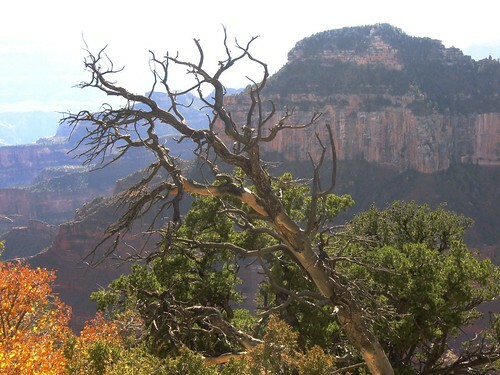 Except this tree is not looking too good. 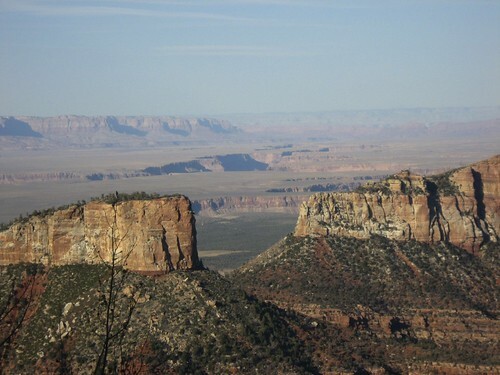 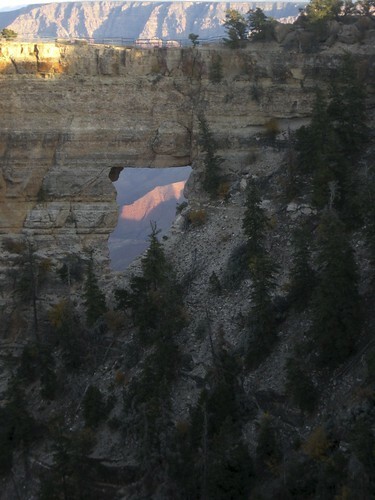 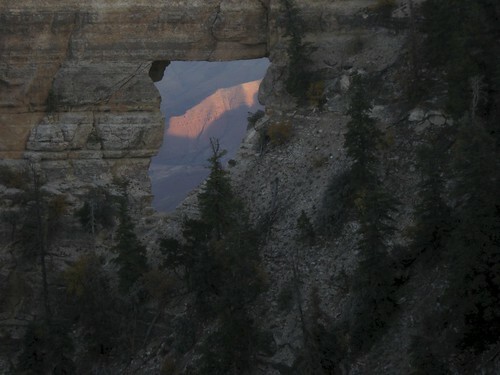 The big butte is Vishnu’s Temple. 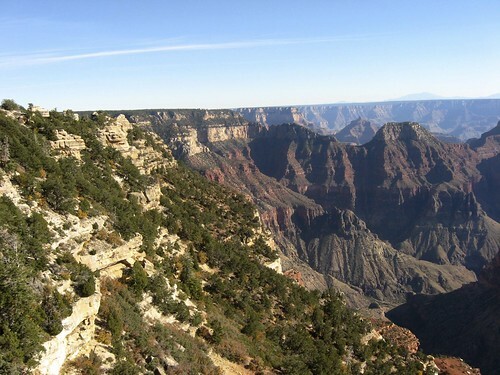 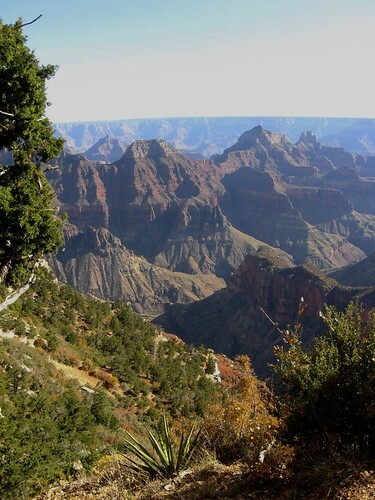 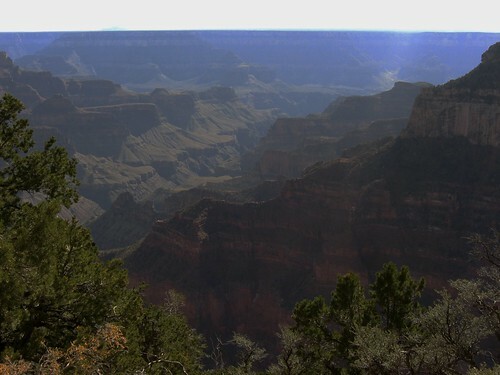 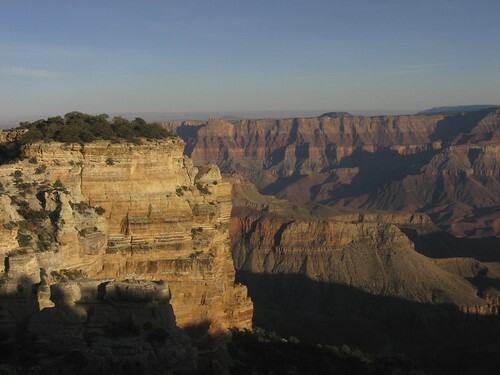 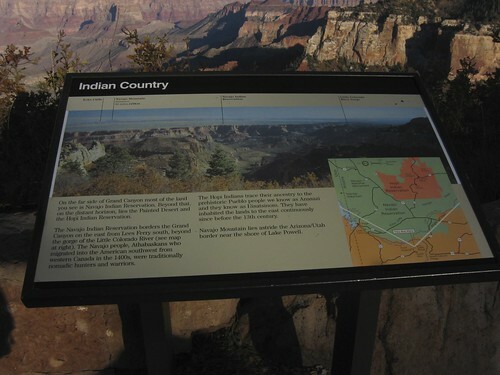 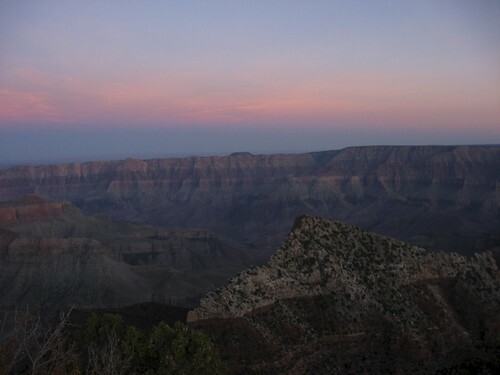 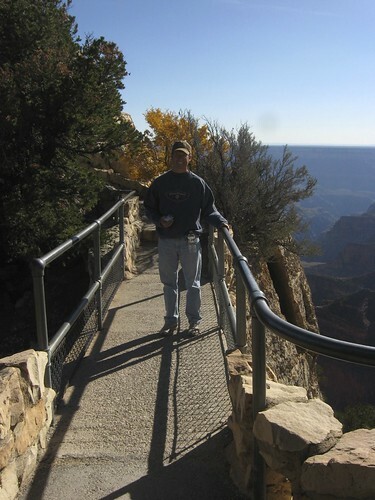 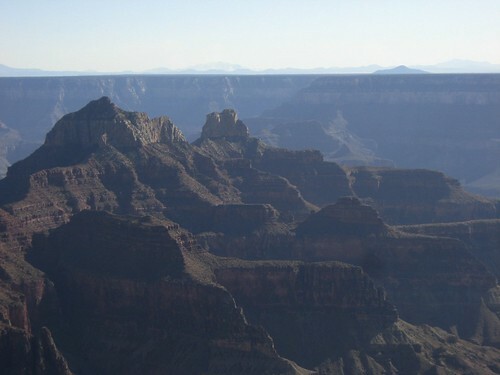 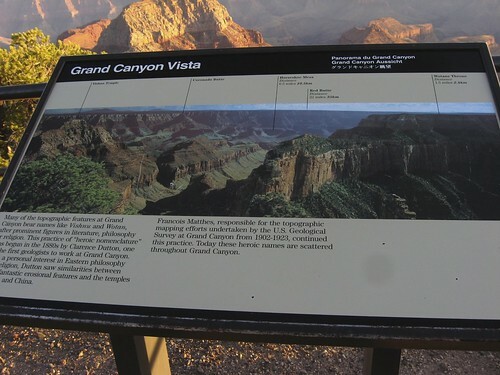 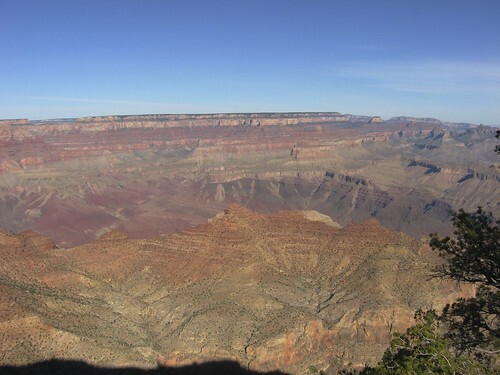 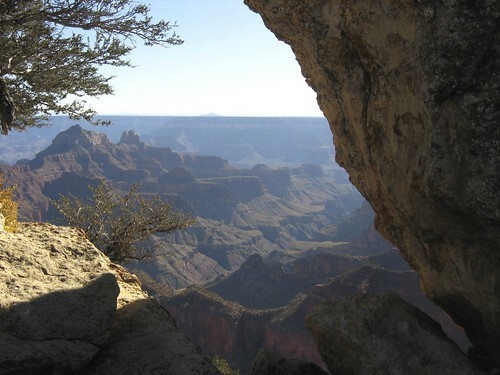 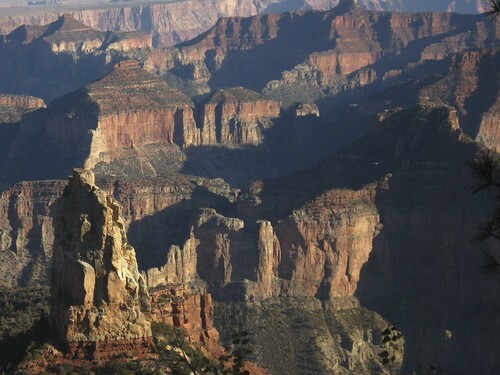 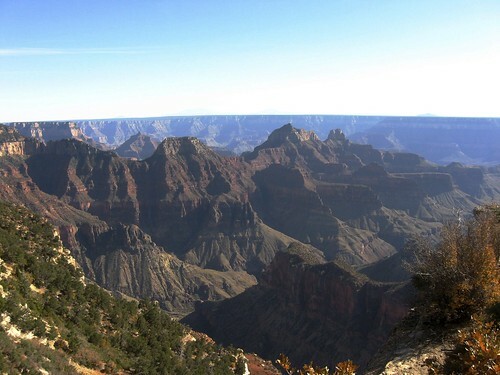 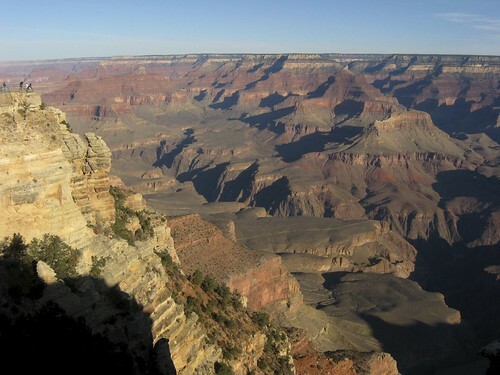 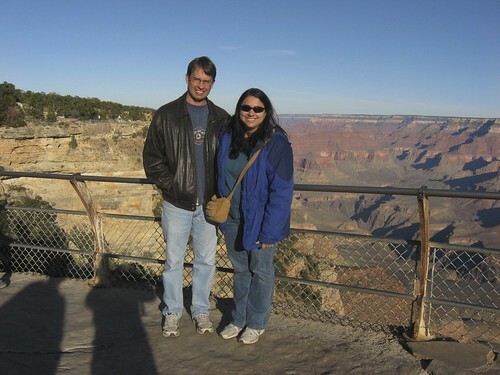 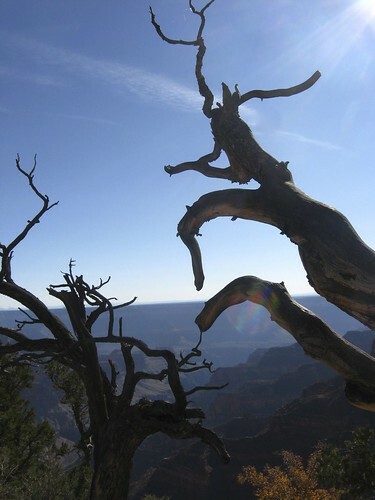 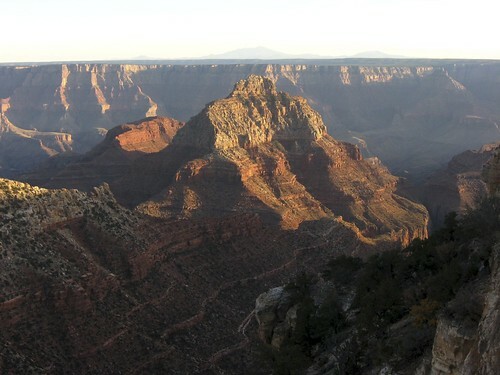 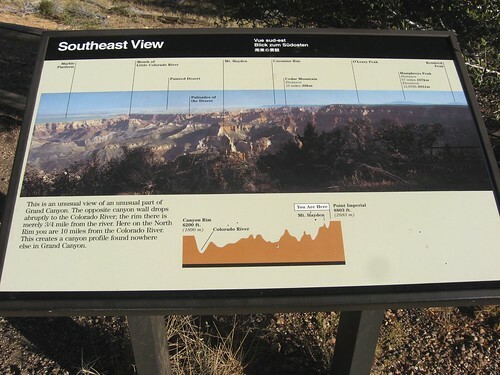 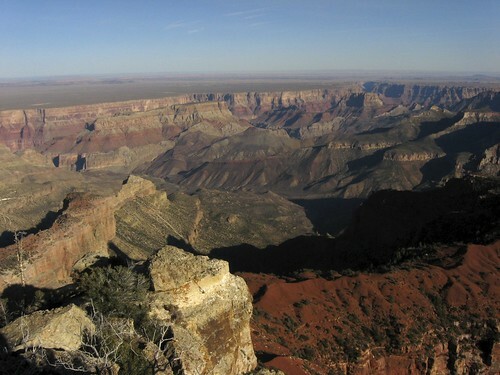 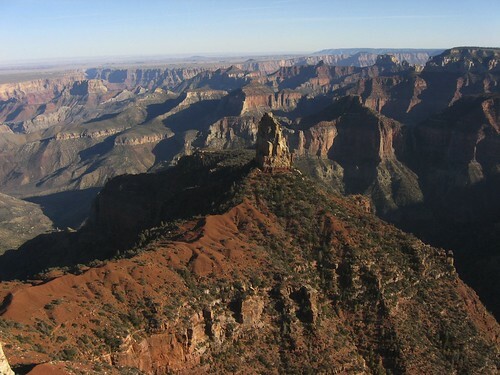 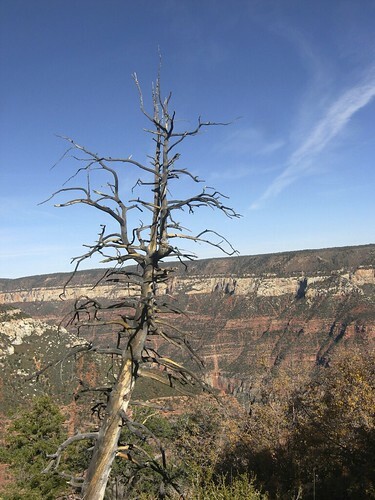 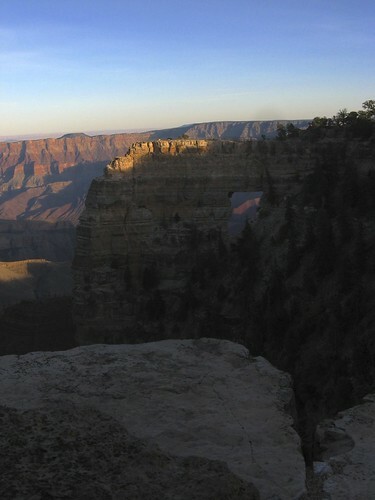 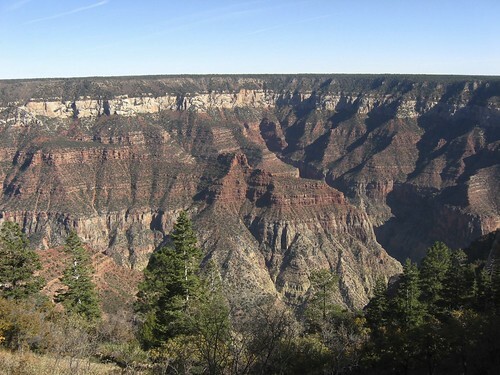 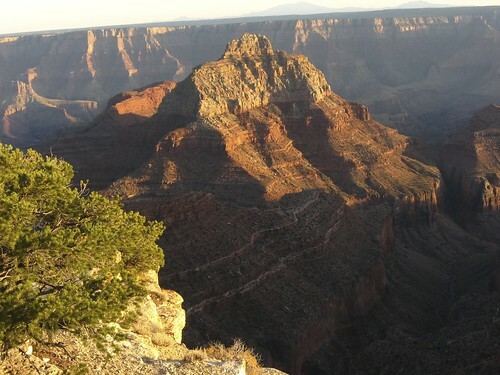 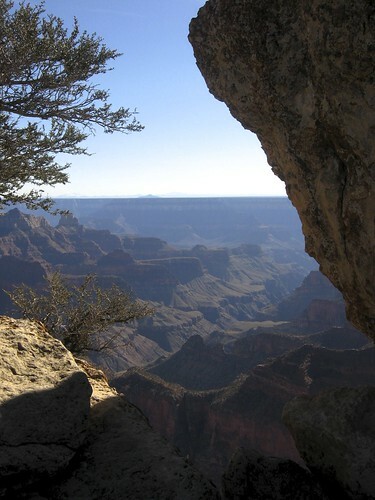 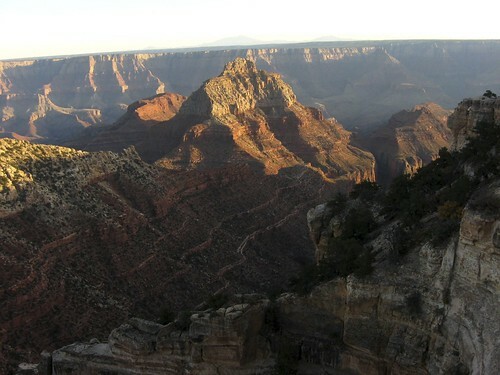 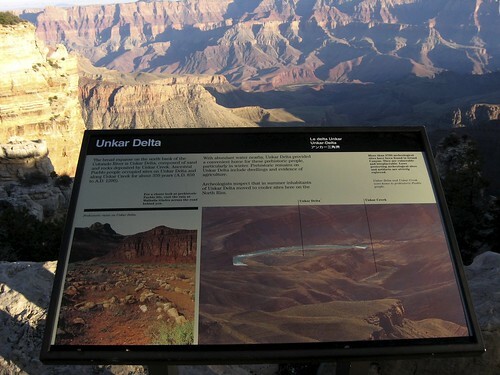 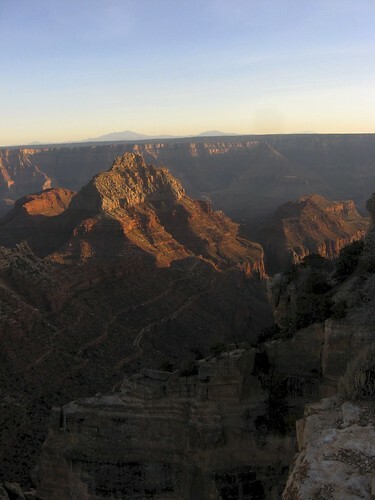 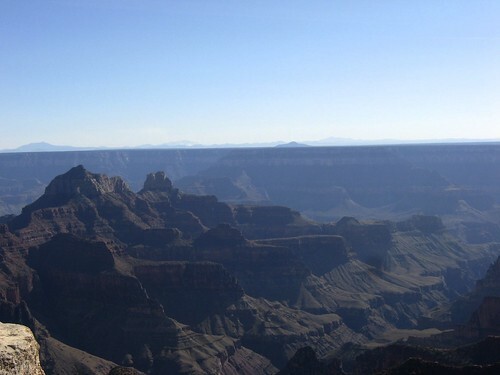 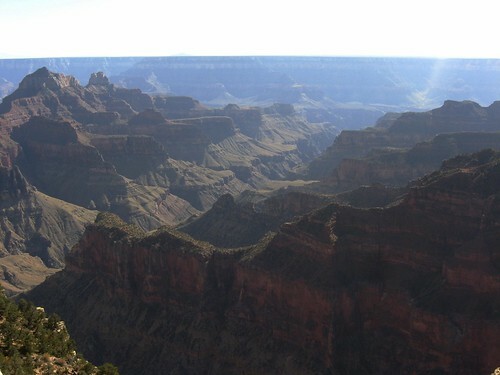 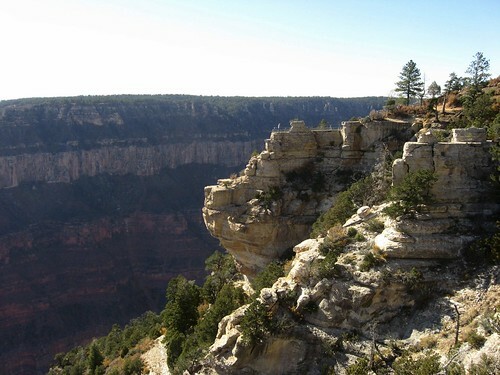 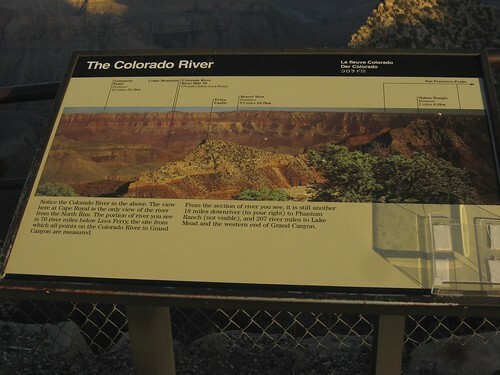 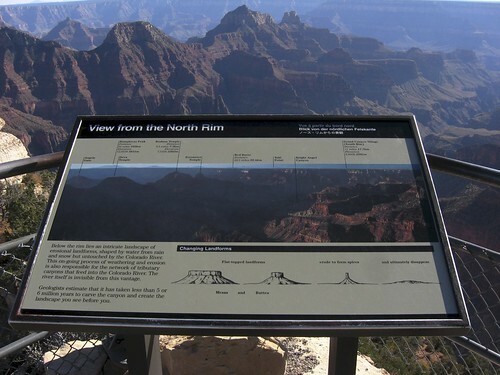 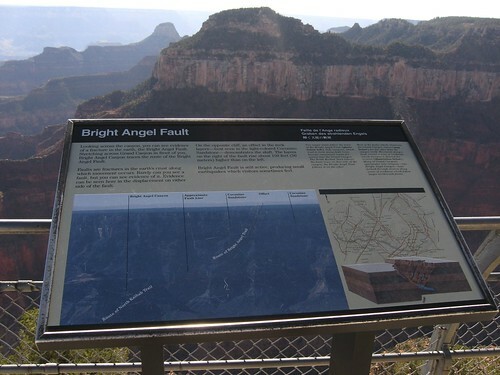 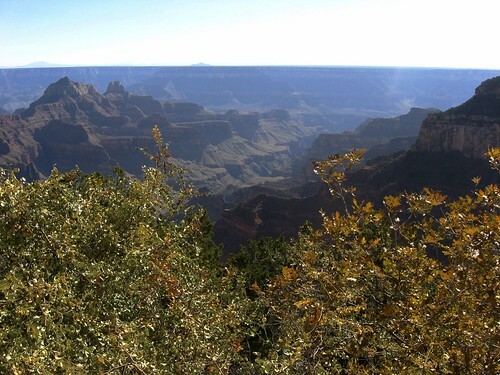 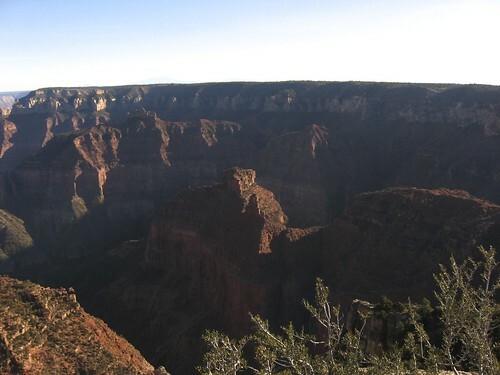 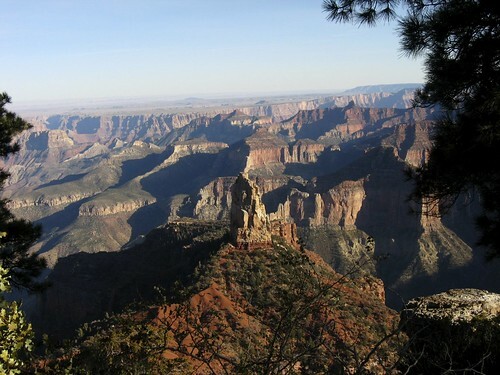 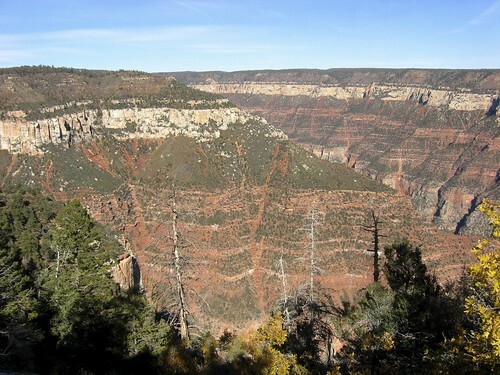 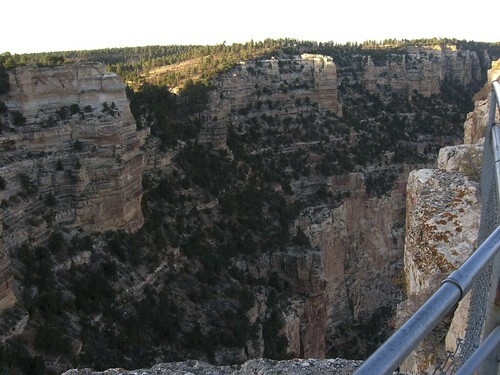 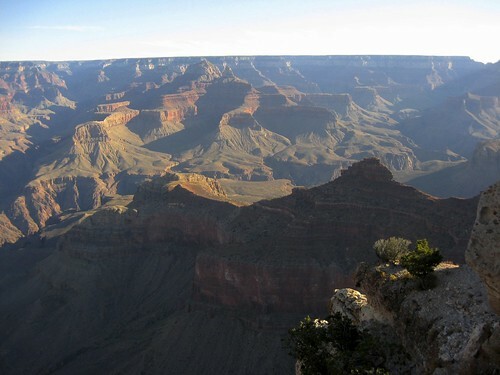 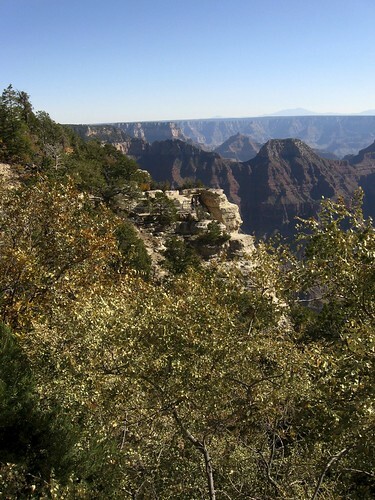 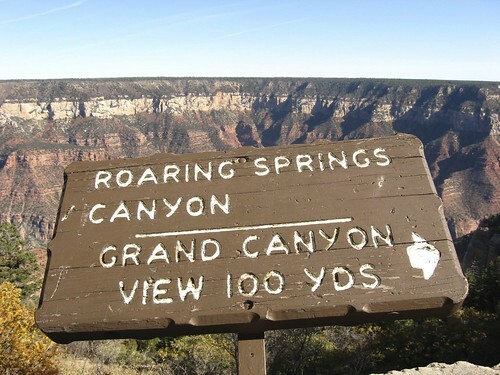 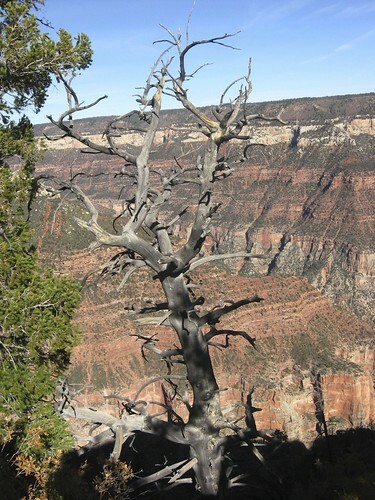 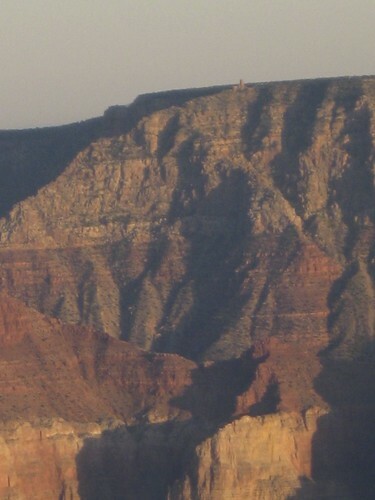 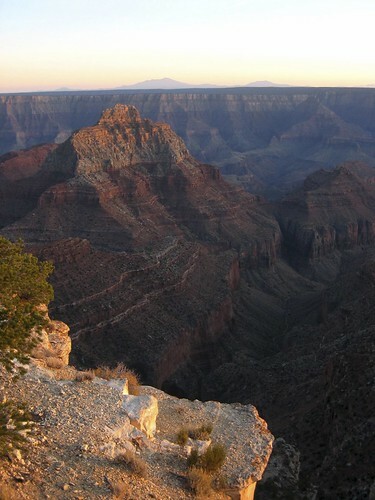 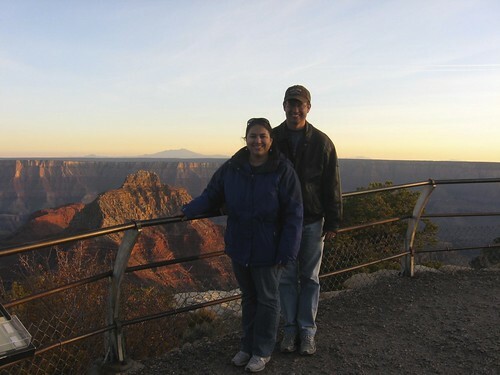 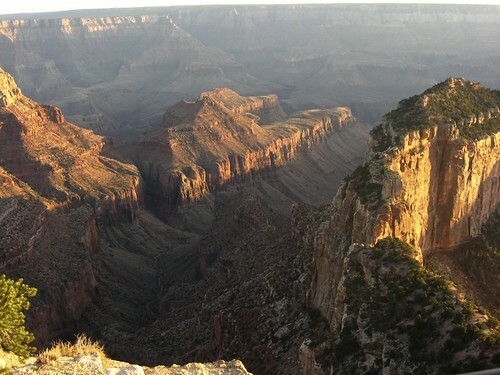 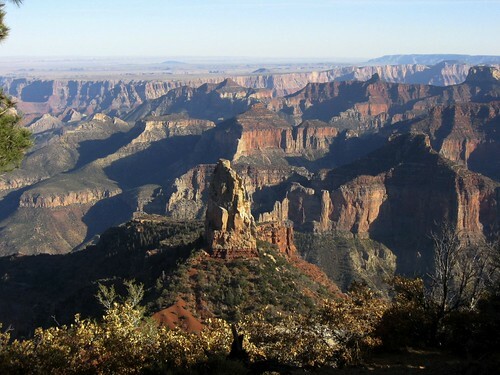 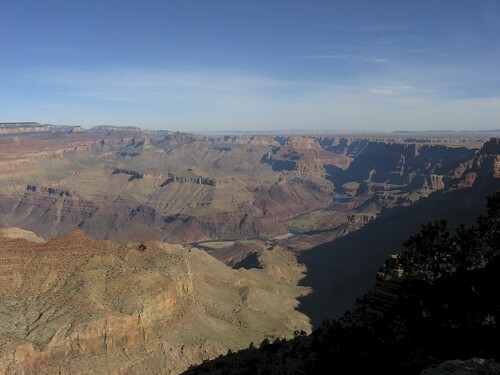 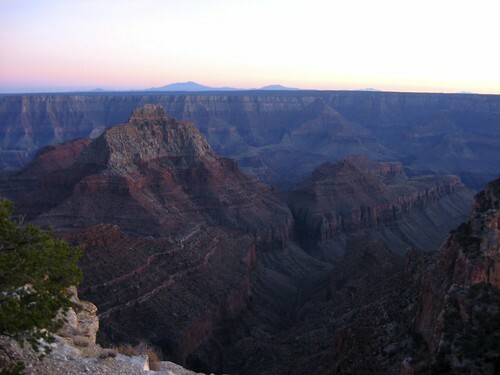 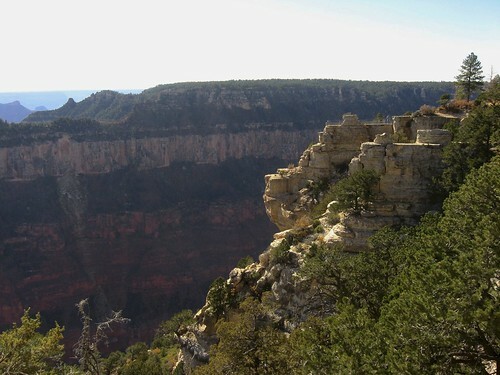 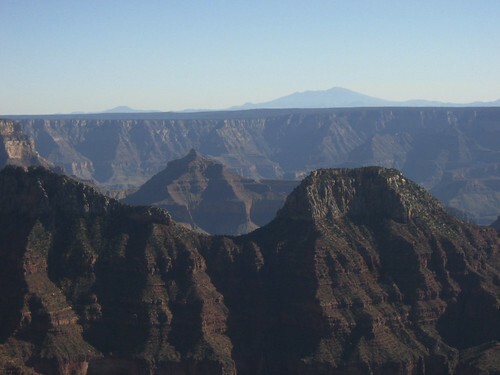 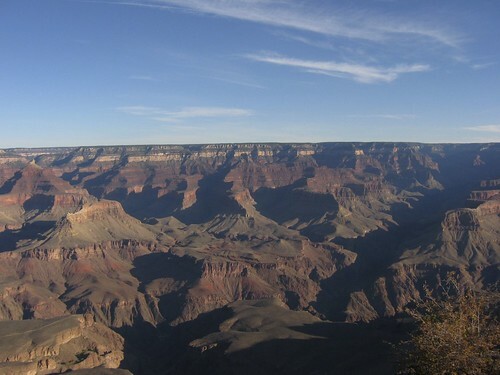 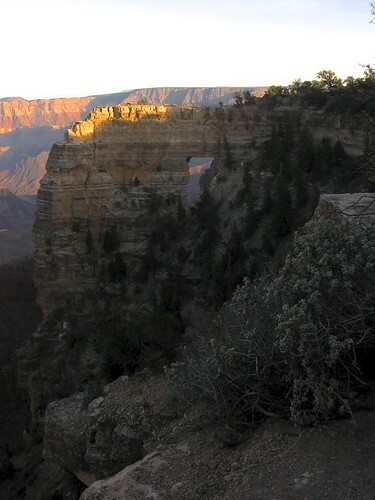 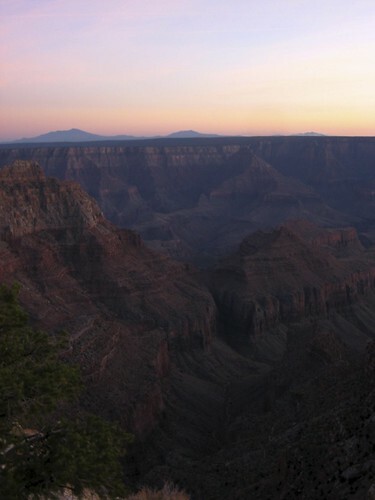 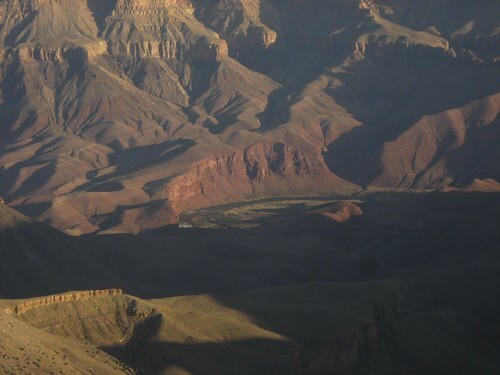 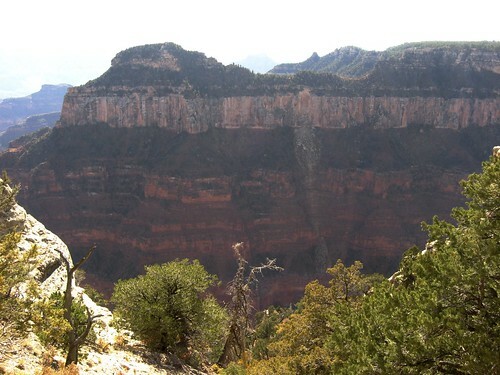 We’re looking across at where the observation tower is on the south rim.